Do you want to make a difference in Schuyler County? 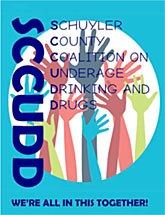 Join SCCUDD today! Did you know that kids whose parents disapprove of underage alcohol and substance abuse are less likely to regularly use alcohol or drugs? Please talk to youth early and often about the dangers of underage alcohol and drug use so they can develop into happy, healthy adults. Serving the youth of our area since 1932. Click here for details. To reach the Simply Your Best website, click here. 703 South Decatur St., Watkins Glen, New York. Call (607) 535-4666. 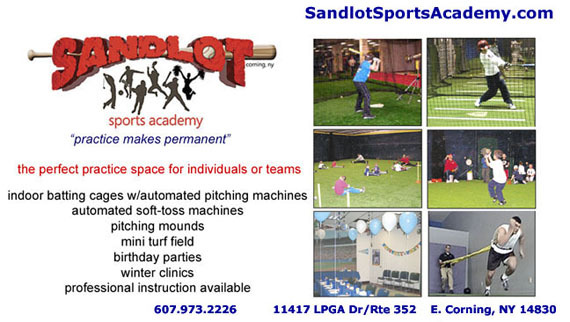 To visit the Schuyler Little League Facebook page, click here or on logo above. Click below to call up a Boosters e-mail form. Mechanics Club - Serving the youth of our area since 1932 - click here for details. Click on the ad below to reach Cayuga Health System's website. MORAVIA, April 24, 2019 -- The Watkins Glen High School varsity tennis team improved to 7-0 Wednesday with a 7-0 victory over Moravia in an Interscholastic Athletic Conference match on the Moravia tennis courts. 1st Singles: Nate Wickham won 6-2, 6-3. 2nd Singles: Dylan Morse won 6-0, 6-1. 3rd Singles: Clint Craven won 6-0, 6-0. 4th Singles: Peter Sandritter won 6-2, 6-1. 1st Doubles: Hannah Morse/Jill Cantieni won 6-1, 6-1. 2nd Doubles: Ali LaMoreaux/Bryson Simmons won 6-1, 6-3. 3rd Doubles: Kathleen Clifford/Enkang Lin won 6-0, 6-0. "I have really enjoyed watching this team perform this season," said Watkins Glen Coach Scott Morse. "Every position played well tonight against Moravia and tried some new things in their matches. There are still many things to work on, but we have played pretty well to this point. Hopefully, we can continue to play well going into a very difficult match at Notre Dame on Thursday." Odessa-Montour's Jacy Knapp prepares to return a Trumansburg volley. ODESSA, April 24, 2019 -- The Odesssa-Montour High School varsity tennis team dropped a 6-1 decision Wednesday to Trumansburg in an Interscholastic Athletic Conference match on the O-M tennis courts. The lone win for the Indians came in the No. 3 doubles match, where Marissa Marsh and Manuela Buffo won 6-2, 6-4. 1st Singles: Dylan Von Neida lost in straight sets, 7-6 (7-3), 6-3. 2nd Singles: Rhys Stermer won the first set 6-2, but lost the next two, 7-5, 6-3. 3rd Singles: Sara Gardner won the second set 6-1, but lost the first one 7-5, and the third one 6-4. 4th Singles: Jacy Knapp lost in straight sets, 6-3, 6-1. 1st Doubles: Cheianne Webster and Dana Zimmers lost 6-3, 6-1. 2nd Doubles: Isabella Arlington and Malia Mertens lost 6-0, 6-0. Photo in text: O-M's No. 1 singles player, Dylan Von Neida, volleys. Left: O-M's Rhys Stermer volleys. Right: The Indians' Sara Gardner eyes the ball. NEWARK VALLEY, April 24, 2019 -- The Seneca Indians varsity baseball team-- behind the 5-hit pitching of Isaac McIlroy -- evened its record at 5-5 Wednesday by shutting out Newark Valley 9-0 in an Interscholastic Athletic Conference road game. McIlroy struck out seven and walked one as he went the distance for the victory. He was also 1-for-3 at the plate with a walk, two runs scored and 2 RBIs. Other hits for the Seneca Indians -- a combined team of Watkins Glen High School and Odessa-Montour athletes -- came from Hunter Holley (2-for-3 with two runs scored), Austin Voorheis (1-for-4 with a run scored), Caleb Thomas (1-for-3 with a run and 2 RBIs), Derrick Lewis (1-for-3 with a run scored), and Ben Mathews (1-for-4 with an RBI). WG/OM scored twice in the 3rd inning, four times in the 5th and three times in the 7th, taking advantage along the way of six NV errors. The Seneca Indians made one error. CANDOR, April 24, 2019 -- The Odessa-Montour High School varsity softball team built an 8-0 lead but couldn't hold on Wednesday, dropping an 8-inning, 9-8 deccision to Candor in an Interscholastic Athletic Conference game on the Candor softball field. Odessa, now 7-3, scored four runs in the 3rd inning and four in the 4th, but Candor rallied with single runs in the 4th and 5th, three runs in both the 6th and 7th, and the game-winner in the 8th. --McKennah Lott went 2-for-3 with a double, two runs scored and 3 RBIs. --Lydia Lynch went 2-for-5 with a double and 3 RBIs. --Madisyn Wells went 2-for-5 with an RBI. --Dezirae Minnier went 2-for-4 with two runs scored. Vondracek went the distance on the mound for O-M, allowing eight earned runs on 11 hits while striking out 17 batters, walking four and hitting one. She yielded two homers -- to Candor's Jennah Kareem and Asia Curkendall. The Seneca Indians' Daniel Lewis lays down a bunt. It went foul, but he soon reached base on a single, coming around later to score. ODESSA, April 24, 2019 -- The Seneca Indians junior varsity baseball team improved to 3-2 Wednesday with a 20-5 victory over Candor in a game on the Odessa-Montour High School baseball field. The Seneca Indians -- a combined team of O-M and Watkins Glen High School athletes -- iced the game with a 10-run outburst in the 5th inning. --Cayden Confer, 1-for-5 with two runs scored and an RBI. Four pitchers took the mound for the Seneca Indians: Lewis, Scholtisek, Pastore and Patel. Together, they struck out 10 batters and walked nine. The Seneca Indians led 5-0 after one inning, and added single runs in the 2nd and 4th. Candor stayed close, scoring twice in the 2nd inning and three times in the 5th to make it 7-5. But WG/OM scored 10 runs in the bottom of the 5th and three in the 6th to pull away. Photo in text: WG/OM first baseman Cayden Confer hauls in a windblown pop fly. The Seneca Indians' Owen Scholtisek dives back safely to first on a pickoff attempt. The Seneca Indians' Cameron Holland rips a line drive to center in the 4th inning. WATKINS GLEN, April 24, 2019 -- The Watkins Glen High School boys varsity golf team fell to 1-3 Wednesday when the Senecas dropped a 212-279 decision to Tioga in an Interscholastic Athletic Conference match on the par-36 Watkins Glen Golf Course. Georgio Fazzary and Ethan Cary led Watkins, each with a 47, while Daniel Ely fired a 58, John Wickham 63, Andrew Hayes 64, and Demitrius Dillon 69. Sam Taylor and John Maciak each shot a 38 for Tioga. The Senecas return to action Friday at the Catatonk Golf Course against Spencer-Van Etten/Candor. HORSEHEADS, April 24, 2019 -- The Odessa-Montour High School boys varsity golf team fell to 0-5 Wednesday with a 284-288 loss to Edison in an Interscholastic Athletic Conference match on the Mark Twain Golf Course's par-35 front-nine. The Indians, who lost by a stroke in their last match, were led by Noah Hollenbeck's 49. Tyler Saunders followed with a 54, Austin Hoyt 60, Alex Willette 62, and Eliza Starkweather 63. Edison (2-2) was led by Nick Root's 48. BINGHAMTON, April 24, 2019 -- The Watkins Glen High School varsity lacrosse team dropped a 20-3 decision Wednesday to Chenango Valley on the road. The Senecas got two goals from Avery Watson and one from Joe Chedzoy. They return to action Friday at home against Dryden. Game time is 5 p.m.
NEWARK VALLEY, April 24, 2019 -- The Watkins Glen High School varsity softball team's record slipped to 1-7 Wednesday when the Senecas dropped a 19-4 decision to Newark Valley in an Interscholastic Athletic Conference road game. The Cardinals scored twice in the 1st inning, 11 times in the 2nd inning and six times in the 3rd while amassing 16 hits and drawing 9 walks. Watkins, which scored all of its runs in the 5th inning -- after which the game was terminated under the "mercy rule" that ends games when one team leads the other by 15 runs or more after five innings -- registered six hits. Claudia Parker, as designated hitter, was 2-for-3 with a run scored and an RBI. Other Watkins hits came from Kelsey Kernan (1-for-3 with a double), Madeline Parker (1-for-3), Cierra Barber (1-for-2) and Maggie Rhoads (1-for-2 with a run scored). The Senecas return to action Tuesday at home against Spencer-Van Etten. It will be Senior Night. To reach the H.L. Stephens website, click here. Team Pal's at BSN Sports, 1327 College Ave., Elmira is a major supporter of The Odessa File's annual Top Drawer 24 Team of outstanding high school students. To see what BSN has to offer you, click here or on the logo at left. Or call (607) 732-8367. BSN Sports in Elmira -- Your team sports specialist! O-M's Jolynn Minnier connects for a base hit and 2 RBIs. She had 6 RBIs in the game. ODESSA, April 23, 2019 -- The Odessa-Montour High School varsity softball team -- behind 6 RBIs from Jolynn Minnier and two-hit pitching by Grace Vondracek -- defeated Newfield 19-0 Tuesday in an Interscholastic Athletic Conference game on the O-M softball field. Minnier went 2-for-3 with three runs scored and Vondracek struck out nine Newfield batters as the Indians won in a game terminated after five innings by the "mercy rule" that ends games after five innings when one team is ahead by 15 or more runs. O-M (7-2) registered seven hits and took advantage of 15 walks to post the victory. The Indians scored 13 runs in the 1st inning, five in the 2nd and one in the 4th. Vondracek went 2-for-2 with her eighth homer of the season, two walks, 2 RBIs and four runs scored. Lydia Lynch was 2-for-3 with a walk, 2 RBIs and three runs scored. The other Odessa hit came from Isabel Foote -- a double. She also walked twice and scored three times. McKennah Lott had an RBI, walking with the bases loaded, and scored three runs. The Indians return to action Wednesday at Candor. Top: O-M's Grace Vondracek sends a pitch on its way. Bottom: Odessa-Montour second baseman Haley Landon hauls in a pop fly. Odessa-Montour's Grace Vondracek connects for a homer, her 8th of the season. A Newfield runner steals second base in the 7th inning. However, he was stranded. ODESSA, April 23, 2019 -- The Seneca Indians varsity baseball team improved to 4-5 Tuesday with a 5-0 victory over Newfield in an Interscholastic Athletic Conference game on the Odessa-Montour High School baseball field. The Seneca Indians -- a combined team of O-M and Watkins Glen High School athletes -- got 4-hit pitching from starter Austin Voorheis and reliever Caleb Thomas. Voorheis pitched six innings, allowing three hits while striking out 10 batters and walking four. Thomas allowed one hit while striking out three in one inning of work. WG/OM registered seven hits while scoring once each in the 1st, 3rd and 4th innings and twice in the 6th. Sean Kelly and Derrick Lewis each had two hits, while Voorheis, Thomas and Isaac McIlory each had one. Voorheis and Lewis each had an RBI. The Seneca Indians return to action Wednesday at Newark Valley. Junior Varsity: The Seneca Indians, on the road, were trailing Spencer-Van Etten 7-6 when rain stopped the game in the top of the 6th inning. 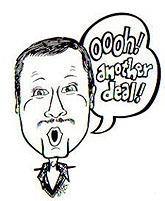 It will be concluded when S-VE visits Odessa-Montour High School on May 6, followed by the regularly scheduled game. WG/OM returns to action at home (at O-M) Wednesday against Candor. Top: Umpire starts to flash the out sign as Seneca Indians second baseman Hunter Holley touches second for a forceout. The throw to first was late. Bottom: The Seneca Indians' starting pitcher, Austin Voorheis. CANDOR, April 23, 2019 -- The Watkins Glen High School boys and girls varsity track teams lost to Candor and Newark Valley Tuesday in an Interscholastic Athletic Conference tri-meet on the Candor athletic field. The Glen boys fell 101.5 to 34.5 to Newark Valley and 65-63 to Candor, while the girls lost 123.5 to 14.5 to Newark Valley and 77-41 to Candor. --Nathan Murphy 110 Hurdles 3rd against NV 22.6; and 2nd in the 400 Hurdles against Candor. --Sam Thorsland 1600 Meters 2nd against NV; and 1st against Candor. --4x100 relay team of Elliott Holland, Raymond Rider, Cale Sutterby and Nick Wilston won against Candor. --Jordan Avery placed 3rd in the 200 against both teams, 2nd in the High Jump against Candor and tied for 2nd against NV. --Max Evans took 1st places in the High Jump against both teams; 1st in the 400 against Candor, and 2nd against NV. --Gabe Planty took 1st in the 800 against both teams; 1st in the 3200 against Candor and 2nd against NV; and 2nd in the 400 against Candor. --Casen Weeden placed 3rd against both teams in the Shot Put and 1st against both teams in the Discus. --Tim Clifford placed 2nd in the 3200 against Candor. --Nick Wilston took 1st in the Long and Triple Jumps against Candor and 2nd in the Long snd Triple against NV. --Cale Sutterby took 1st in the Pole Vault against Candor. --Haley Dean took 1st against NV in the 100 Meters with a new PR of 13.9. She also tied for 2nd in the 200 with NV and took 3rd against Candor. She also placed 3rd in the Long Jump against both teams. --Breanna Carl placed 1st in the 1500 Meters against Candor and 3rd against NV. She also placed 1st in the 3200 against Candor and 3rd against NV. --Kaylana Rekczis placed 3rd in the 1500 against Candor and 3rd in the Discus against Candor. --The girls 4x100 Relay of Haley Dean, Jena Slater, Maya Somerville and Madelyn Suddaby won against Candor. --Breanna Hayes won the 400 Meter Hurdles against Candor, and placed 2nd in the Triple Jump against Candor. --Madelyn Suddaby won the Triple Jump against Candor and placed 3rd against NV; and placed 3rd in the 200 against NV. --Jena Slater placed 3rd in the Triple Jump against Candor; and 2nd in the Pole Vault against NV and 1st against Candor. O-M's Nadia Simpson clears the bar on the way to victory in the High Jump. ODESSA, April 23, 2019 -- The Odessa-Montour High School boys and girls varsity track and field teams defeated Tioga Tuesday in an Interscholastic Athletic Conference meet on the O-M athletic field. The Odessa boys won 88-53, while the girls won 101-38. Nadia Simpson and Kennedey Heichel posted four victories apiece while Lexi Saunders, Tori Brewster and Morgan Burnham had three wins each as the Indians rolled past the Tigers. "I'm very proud," said Coach Burton Brewster. "The girls ran incredibly well." Simpson won the 100 (12.7), the 200 (a personal best of 26.7) and the High Jump (4' 2"), and was on the winning 4x100 Relay team (with Heichel, Tori Brewster and Ida Sidle). The Relay squad had the fastest time for the school (52.1) since 2011. Heichel won the 100 Meter Hurdles (16.7), the 400 Meter Hurdles (1:14.7) and the Pole Vault (9 feet) in addition to the 4x100. Saunders won the 1500 (in 6:42.6), the 3000 (in 15:25) and the Shot Put, where she set a personal best of 27' 0.5". Brewster won the Long Jump (15' 4.5") and the Triple Jump (with a personal best of 31' 4.5") in addition to the 4x100, and was second in the 200 in 27.7. Burnham won the 800 (in 2:57) and was on the winning 4x400 and 4x800 Relays, the latter with Camille Sgrecci, Maria Scata and Katie Adams, and the former with Sgrecci, Maddie Morrissey and Delaney Paulisczak. Sgrecci was also second in the 800 (in 3:02.3). Hannah Nolan set PRs (Personal Records) in the 100 Hurdles (17.8) and the Long Jump (12' 10"). Autumn Garrison set a PR in the Shot Put (23' 5"), as did Felisha Cook in the Long Jump (11' 7.5") and Scata in the 3000 (in 17:59.1). Paden Grover posted three victories, while Preston Harris, Will Yeater and Zach Elliott had two apiece as the Indians cruised to their win. --Will Yeater in the 1600 Meters (5:17.3) and the 3200 (in12:28). --Noah Brewster in the 400 in 56.2. --Brock Sgrecci in the 800 Meters in 2:20.2. --Paden Grover in the Long Jump (18' 6"), Triple Jump (37' 9.5") and High Jump (5' 10"). --Andrew Hartford in the Pole Vault (10' 6"). Second places for O-M were posted by Dylan Houseknecht in the Shot Put (38'), Eric Rumsey in the Discus (107' 7"), Brock Sgrecci in the High Jump (5' 4"), Ryan Griswold in the Triple Jump (34' 1"), Preston Harris in the Long Jump (18' 4"), Micah Brewster in the 3200 Meters (13:05), Andrew Hartford in the 400 Hurdles (1:07), and Paden Grover in the 110 Hurdles (17.1). Senior Night: Odessa-Montour seniors were honored in a ceremony before the meet. On the girls' team, seniors are Kennedey Heichel, Maddie Morrissey, Leah Overhiser, Hannah Rosier, Lexi Saunders, Maria Scata, Nadia Simpson and Hannah Bruno. On the boys' team, seniors are Noah Brewster, Tyler Carson, Josh Bravo, Zach Elliott, Andrew Hartford, Dylan Houseknecht, Jonah Thompson and Will Yeater. Top: O-M's Andrew Hartford clears the bar en route to victory in the Pole Vault. Second: The Indians' Tori Brewster goes airborne in the Long Jump, which she won. Third: O-M's Preston Harris competes in the Long Jump. He placed second. Bottom: Senior Kennedey Heichel is greeted by Coach Burton Brewster during Senior Night ceremony. O-M's Maddie Morrissey, right, hands the baton to Camille Sgrecci in the 4x400 Relay. Left: Paden Grover in the 110 Meter Hurdles. Right: Hannah Nolan in the 100 Hurdles. Left: O-M's Delaney Paulisczak competes in the High Jump. Right: Odessa's Kennedey Heichel on the way to victory in the 100 Meter Hurdles. Odessa-Montour shot putters Leah Overhiser and Dylan Houseknecht. O-M's Morgan Burnham, left, receives baton from Delaney Paulisczak in the 4x400 Relay. Left: O-M's Lexi Saunders. Right: The Indians' Autumn Garrison. Seniors on the O-M team werre honored in a ceremony held before the meet. Left: Kennedey Heichel on the way to win in the Pole Vault. Right: Nadia Simpson. Left: Micah Brewster. Right: From left, Katie Adams, Camille Sgrecci, Morgan Burnham. Left: O-M's Paden Grover on the way to victory in the High Jump. Right: Maria Scata. Watkins Glen catcher Lydia Lynch gets the out sign after tagging a Southern Cayuga player in a play at the plate. ODESSA, April 22, 2019 -- The Odessa-Montour varsity softball team improved its season mark to 6-2 Monday with doubleheader wins, 4-0 and 8-3, against Southern Cayuga in Interscholastic Athletic Conference games on the O-M softball field. Odessa pitcher Grace Vondracek posted a no-hitter in the opener, striking out 11 batters, walking one and hitting one. She also had O-M's lone hit -- a homer (her seventh) as she went 1-for-1 at the plate with two walks, a run scored and 2 RBIs. Also scoring in that game were McKennah Lott (who drew two walks), Jolynn Minnier (one walk) and Dezirae Minnier (one walk). The Indians drew eight walks and stole six bases -- two each by the Minniers and one each by Isabel Foote and Lydia Lynch. Odessa scored once in the 2nd, twice in the 3rd and once in the 4th. Vondracek went the distance again, allowing two earned runs on four hits while striking out nine and walking one. She also went 3-for-3 at the plate, including a double, and scored a run. Odessa took the lead early, scoring three runs in the 1st, and iced the game with five runs in the 3rd. Southern Cayuga scored a run in the 3rd and two in the 4th. Other hits for O-M came from Foote (1-for-3), McKennah Lott (1-for-1 with a double, two runs scored and 2 RBIs), and Emma Lodge (1-for-2 with a run scored). Raven Lott also had an RBI and a run scored. Others with a run each were Lynch, Rebecca Wolfe and Sam Sipes. The Indians return to action Tuesday at home against Newfield. Top: Odessa-Montour's Grace Vondracek delivers a pitch. Bottom: O-M's McKennah Lott slides safely into home, scoring on a passed ball. Odessa-Montour's Dezirae Minnier stretches to secure the ball for a putout at first. O-M shortstop Isabel Foote looks toward first base after stopping a grounder to her right. She threw from her knees, but too late for a putout. Odessa-Montour's Jolynn Minnier dances out of the way on an inside pitch. Odessa-Montour's Raven Lott catches a throw at first for a putout as second baseman Haley Landon moves over to back up the play. SOUTHPORT, April 22, 2019 -- The Seneca Indians varsity baseball team's record slipped to 3-5 Monday with a 5-1 loss to Elmira Notre Dame in an Interscholastic Athletic Conference game on the ND baseball field. The Crusaders (4-3) took the lead 4-0 with two runs each in the 1st and 2nd innings, and added a run in the 6th. The Seneca Indians -- a combined team of Watkins Glen High School and Odessa-Montour athletes -- scored their lone run in the 2nd inning. Notre Dame registered seven hits off of two WG/OM pitchers, Derrick Lewis (who pitched into the 6th inning) and Caleb Thomas. The Seneca Indians managed two hits, with Thomas going 2-for-3 with a run scored. WG/OM returns to action Tuesday with a game on the O-M baseball field against Newfield. The Seneca Indians' Jacob Pierce approaches third base. The throw got past the third baseman, and Pierce scored. ODESSA, April 22, 2019 -- The Seneca Indians junior varsity baseball team improved to 2-2 Monday with a 26-7 victory over Southern Cayuga in a game on the Odessa-Montour High School baseball field. The Seneca Indians -- a combined team of O-M and Watkins Glen High School athletes -- scored six times in the 1st inning, five times in the 2nd, 10 times in the 3rd and five times in the 4th. They amassed 14 hits along the way, with four by Adam Pastore and three by Cameron Holland. Pastore, Cayden Confer and Jared Rumsey pitched for WG/OM. Photo: The Seneca Indians' Cayden Confer attacks the ball. He grounded out, but drove in a run on the play. Watkins Glen's Hannah Morse volleys. She and doubles teammate Jill Cantieni won. WATKINS GLEN, April 22, 2019 -- The Watkins Glen High School varsity tennis team improved its mark to 6-0 Monday when it defeated Edison 6-1 in an Interscholastic Athletic Conference match on the WGHS tennis courts. The Senecas got singles wins from Dylan Morse, 6-1, 6-3; Clint Craven, 6-0, 6-0; and Peter Sandritter, 6-4, 6-1. All three doubles teams also won: Hannah Morse-Jill Cantieni, 6-0, 6-0; Ali LaMoreaux-Bryson Simmons, 6-1, 6-2; and Kathleen Clifford-Enkang Lin, 6-1, 6-0. The only loss came in the No. 1 singles match, where Nate Wickham fell 6-2, 6-2. "I was really happy with the way we played coming off spring vacation," said Watkins Glen Coach Scott Morse. "The kids are very focused and working hard. We have a busy week with four matches in five days, including playing a very talented Notre Dame team away on Thursday." Photo in text: Watkins Glen's Clint Craven, with the score sign in the foreground, volleys on the way to victory. Watkins Glen's Nate Wickham returns a volley in his No. 1 singles match. ITHACA, April 22, 2019 -- The Watkins Glen High School boys varsity golf team improved to 1-2 Monday when it defeated Odessa-Montour 285-286 in an Interscholastic Athletic Conference match on the Hillendale Golf Course's par-35 front nine. The Senecas were led by Georgio Fazzary's 45. Daniel Ely posted a 54, while Ethan Cary shot 57, Jonathan Wickham 63, and Andrew Hayes 66. O-M (0-4) was led by Tyler Saunders' 43, while Noah Hollenbeck shot 47, Austin Hoyt 60, Brett Walters 67, and Alex Willette 69. WATKINS GLEN, April 22, 2019 -- The Watkins Glen High School varsity lacrosse team's record slipped to 1-5 Monday when the Senecas dropped a 13-4 decision to Elmira Notre Dame in a game on the WGHS athletic field. Joe Chedzoy scored three goals for the Senecas, who return to action Wednesday at Chenango Valley. They then play Friday at home against Dryden. Photo: Watkins Glen's Joe Chedzoy (5) and Dawson Wade (9) battle for possession of the ball. SOUTHPORT, April 22, 2019 -- The Watkins Glen High School varsity softball team's record slipped to 1-6 Monday when the Senecas fell 23-2 to Elmira Notre Dame in an Interscholastic Athletic Conference game on the ND softball field. The game was terminated after five innings under the "mercy" rule that ends contests early if one team leads the other by 15 or more runs after five innings. The Crusaders, who registered 19 hits, scored eight runs in the 1st inning, seven in the 2nd, six in the 3rd and two in the 4th. Watkins Glen, which had seven hits, scored both of its runs in the 3rd inning. Hits for Watkins were registered by: Kelsey Kernan (1-for-3 with a triple and a run scored), Katie Losey (1-for-3 with a run scored), Madeline Parker (2-for-3 with a double and 2 RBIs), Madyson Simpson (1-for-2), Sara Augustine (1-for-1), and Hayley Cornish (1-for-2). The Senecas return to action Wednesday at Newark Valley. CORNING, April 22, 2019 -- Odessa-Montour High School track athletes Paden Grover and Kennedey Heichel posted victories in the Pentathlon at the recent Square Deal Track Invitational. Grover amassed 2582 points to lead the men's field in the combined Pentathlon events. Heichel totaled 2095 to lead the women's field. DRYDEN, April 22, 2019 -- Odessa-Montour High School senior McKennah Lott has signed a letter of intent to play soccer at Tompkins-Cortland Community College in the fall. Lott, recently honored as a Student of the Month by the Watkins-Montour Rotary Club, has played soccer, basketball and softball at O-M. The barbecue pit behind the Montour Moose Lodge was a busy place Saturday morning. MONTOUR FALLS, April 20, 2019 -- The Seneca Indians varsity baseball team -- with the help of the Montour Moose Lodge -- held a chicken barbecue fund-raiser Saturday at the Moose Lodge. The Seneca Indians -- a combined team of Watkins Glen and Odessa-Montour High School athletes -- took an active role in the barbecue, packing meals in the kitchen, distributing 50-50 raffle tickets and (dressed as chickens) encouraging passing motorists to stop by for a meal. The event was termed "a great success" by team Coach Jason Westervelt, who said the money raised will be used to purchase team caps and team gear for all three levels of the baseball program. Photo in text: Members of the Seneca Indians were working in the kitchen. Seneca Indians Johnny Niedermaier, left, and Sean Kelly were alerting passing motorists about the ongoing chicken barbecue. LANSING, April 17, 2019 -- The Watkins Glen High School varsity softball team's record slipped to 1-5 Wednesday when the Senecas dropped a 15-1 decision to Dryden in an Interscholastic Athletic Conference game at the Lansing recreational park. Dryden's softball field is undergoing reconstruction. Dryden, which amassed 16 hits, jumped in front 4-0 in the 1st inning, and added one run in the 2nd, six runs in the 4th and four runs in the 5th. Watkins Glen, which registered eight hits, scored its lone run in the 5th inning after leaving the bases loaded in the 2nd and 3rd innings. Claudia Parker went the distance on the mound for Watkins Glen, striking out four batters, walking five and hitting one. Cierra Barber was 3-for-4 for the Senecas, while Madyson Simpson was 2-for-3 with an RBI. Parker went 1-for-4, Nancy Jackson 1-for-3, and Maggie Rhoads 1-for-3. Watkins Glen returns to action Monday at Elmira Notre Dame. SCHUYLER COUNTY, April 14, 2019 -- A softball pitcher and three track standouts -- all from Odessa-Montour High School -- are this week's Odessa File Athletes of the Week. Tori Brewster, an 8th grader, who set a personal best in winning the Long Jump at the 22-team Molly Dry Memorial Invitational at Mansfield University. She leaped 15' 8.25''. Nadia Simpson, who won the 100 Meter Dash at the Molly Dry Invitational, posting a time of 13.03. Zach Elliott, who won the Shot Put and Discus at the Molly Dry meet, registering distances of 51' 2.5" and 146' 6" respectively. Grace Vondracek, a pitcher/hitter whose softball team won three of the four full games it played (losing the conclusion of an earlier suspended game). She struck out 67 batters, and had 12 hits in the four games with five homers and 11 RBIs. Double Honorable: Watkins Glen tennis players Nate Wickham, Dylan Morse, Clint Craven, Hannah Morse, Jill Cantieni, Ali LaMoreaux and Bryson Simmons; O-M track's Kennedey Heichel and Preston Harris; Watkins Glen track's Max Evans and Gabe Planty; Watkins Glen lacrosse's Joe Chedzoy; and O-M softball's Lydia Lynch and Isabel Foote. Honorable Mention: Another 35 athletes earned a point apiece in the ongoing poll that helps determine seasonal All-Stars and, ultimately, Athletes of the Year at each of the two schools covered. ROME, Pa., April 13, 2019 -- The Seneca Indians varsity baseball team lost the first game and won the second in a four-team tournament Saturday at Northesst Bradford High School. The Seneca Indians (3-4) -- a combined team of Watkins Glen and Odessa-Montour high school athletes -- dropped the first game to Northeast Bradford, 8-5. It defeated Susquehanna Valley in the second contest, 9-2. WG/OM gained the early advantage with single runs in the 1st and 2nd innings, but NEB erupted for all of its runs in the 3rd inning. The Seneca Indians fought back with two runs in the 5th and one in the 6th, but fell short. The Seneca Indians got two hits each from Johnny Niedermaier (2-for-4), Derrick Lewis (2-for-3 with a run scored and an RBI), and Hunter Holley (2-for-3). Other hits came from Caleb Thomas (1-for-4 and an RBI), Isaac McIlroy (1-for-3 with a run scored), Ben Mathews (1-for-4 with an RBI), and Josiah Wysocki (1-for-4 with a run scored). Austin Voorheis pitched the first 2 2/3 innings, allowing all eight runs (but none earned; WG/OM committed four errors in the game). Wysocki and Thomas pitched in relief. WG/OM jumped out to a 5-0 lead in the first two innings, and added four more runs in the 5th -- all on five hits, but with 12 walks fueling the offense. Ben Mathews had two of the Seneca Indians' hits (2-for-2 with a run scored), while Sean Kelly, Derrick Lewis and Josiah Wysocki had one each. Kelly also drew three walks and scored two runs, while Austin Voorheis drew two walks and scored three times. Lewis and Caleb Thomas had two RBIs each, while Kelly, Voorheis and Isaac McIlroy had one each. McIlroy went the distance on the mound for WG/OM, allowing two runs on seven hits while striking out eight batters and walking two. WHITNEY POINT, April 13, 2019 -- The Watkins Glen High School varsity softball team's game at Whitney Point was suspended with two outs in the bottom of the fifth inning Friday when a downpour prompted a stoppage of play with WGHS leading 12-1. "Now we've gotta drive back over there to finish the game," said Watkins Glen Coach Jim Scott, who said the game could have been called complete after five innings. His team, he said, got two outs in the 5th when an attempted force play at second base was short-circuited by an error. Then the rains came in earnest. A Seneca Indians varsity baseball game, also at Whitney Point on Friday, was stopped in the bottom of the fifth inning with the visitors -- a combined team of WGHS and Odessa-Montour High School athletes -- ahead 7-3. That, too, was suspended pending a revisit to Whitney Point on a date to be announced, Coach Jason Westervelt said. MANSFIELD, Pa., April 13, 2019 -- Odessa-Montour senior Nadia Simpson placed first Friday in the 100 Meter Dash at the Molly Dry Memorial Invitational track and field meet at Mansfield University, while 8th grader Tori Brewster won the Long Jump and senior Zach Elliott captured the Shot Put and Discus titles. The O-M girls finished in 9th place among 22 teams with 33 points. The Odessa boys were 11th among 22 teams with 29 points. Simpson won the 100 in 13.03, while Brewster took the Long Jump with a leap of 15' 8.25" (a personal record). Elliott won the Shot with a throw of 51' 2.5" and the Discus with a throw of 146' 6". Other points for the girls were earned by Kennedey Heichel, third in the Pole Vault at 8' 6" and fifth in the 100 Meter Hurdles (17.31); Hannah Bruno, 7th in the Triple Jump at 31' 4.5", and Hannah Nolan, 8th in the Triple Jump with a PR of 30' 5.5". Ida Sidle posted a season-best 13' 1" in the Long Jump, while Autumn Garrison registered a PR of 71' 9" in the Discus. Other points for the boys were earned by Preston Harris, fourth in the 110 Meter Hurdles in 17.09; and Brock Sgrecci and Paden Grover, tied for fifth in the High Jump at 5' 4". O-M's McKennah Lott starts her home run swing, which sent the ball (right) over the fence in left field for the Indians' first run of the full second game. ODESSA, April 12, 2019 -- Thurday's varsity softball action at Odessa-Montour High School started with the conclusion of a varsity softball game called last week because of darkness while tied 7-7. That ended badly for Odessa-Montour, with Marathon winning 10-7. Then Marathon scored early in a succeeding, full game -- before Odessa erupted with three straight homers in the bottom of the 1st inning that helped propel the Indians to extra innings and a 5-4 victory that lifted their record to 4-2. Those homers -- each over the left field fence -- came off the bats of McKennah Lott, Grace Vondracek and Lydia Lynch. Vondracek's homer was her sixth in five games; Lynch's was her second, and it came while she was playing on a sprained right ankle that limited her mobility. The injury had come in a game at Newfield on Wednesday. Another injury occurred midway through Thursday's game, this time sending the O-M coach, Bill Lindsley, to the hospital. He was hit in the left eye by the ball while warming up his pitcher, Vondracek, knocking him to the ground. Doctors determined nothing had been seriously damaged, and Lindsley returned, his eye discolored and slightly swollen, just after his team's victory, the players gathering around him to greet him back and to pose with him for a team photo. Vondracek, meanwhile, went the distance on the mound for Odessa, concluding the first game and then going nine more innings -- 11 for the day and 17 over the past two days. She struck out 17 batters and walked one in the nine-inning game while allowing two earned runs on seven hits. Marathon -- which won the first game with three runs in the 6th inning while holding the Indians scoreless in the 6th and 7th -- scored a run in the 1st inning of the nightcap with a single, two stolen bases and a fielder's choice. It scored two more runs in the 3rd inning on a single, a couple of passed balls and an error, and registered its final run in the 5th on a pair of doubles. It missed an opportunity in the top of the 9th when a runner, on with a single and advanced to third base, tried to steal home, only to be tagged out by O-M's alert catcher, Lynch. Odessa, in addition to its home run blitz in the 1st inning, scored a run in the 4th inning when Rebecca Wolfe singled, stole second and moved to third on a passed ball, scoring on a Vondracek double. O-M threatened in the 8th inning, putting runners on first and second on a single by Sam Sipes and a walk to Wolfe, but the rally ended when Lott drilled a liner to the centerfielder. In the 9th, Vondracek opened with a single, moved up on a single by Jolynn Minnier and a walk to Raven Lott, and scored on a Sipes single to the right side of the infield. Vondracek led the Indians with three hits (3-for-3 with two runs scored an an RBI), while Sipes had two hits and McKennah Lott, Wolfe, Isabel Foote, Lynch, Emma Lodge and Minnier one apiece. Completed game: The first game, played over two days in two different weeks, saw O-M total six hits, with Vondracek (2-for-4 with a homer) and Foote (2-for-3 with 2 RBIs) leading the offense. Minnier and Haley Landon had one hit each, while Landon and Lodge each had an RBI. Vondracek pitched a complete game, allowing eight earned runs on 10 hits while striking out 11 and walking three. Top: O-M's Sam Sipes connects for a base hit. She later had a second hit, an infield single that drove in the winning run. Second: Odessa's Jolynn Minnier steals second base after drawing a walk. Third: O-M catcher Lydia Lynch, right, prepares to tag out a Marathon runner trying to steal home in the 9th inning. Fourth: Odessa pitcher Grace Vondracek struck out 17 batters in the second game. Bottom: Odessa-Montour first baseman Raven Lott hauls in a throw for a putout. Left: O-M shortstop Isabel Foote prepares to throw out a Marathon batter after fielding a grounder. Right: McKennah Lott watches as her 8th inning drive to center is caught. Odessa-Montour's Lydia Lynch launches a homer, her team's third in a row. Left: O-M's Lydia Lynch is greeted at home plate by teammates after her homer. Right: The Indians' Rebecca Wolfe slides home in the 2nd inning, but was tagged out. Odessa-Montour's Grace Vondracek launches her 1st inning home run. The O-M team gathered down the right field line after greeting Coach Bill Lindsley there upon his return after the game from the hospital, where he was treated for an eye injury. 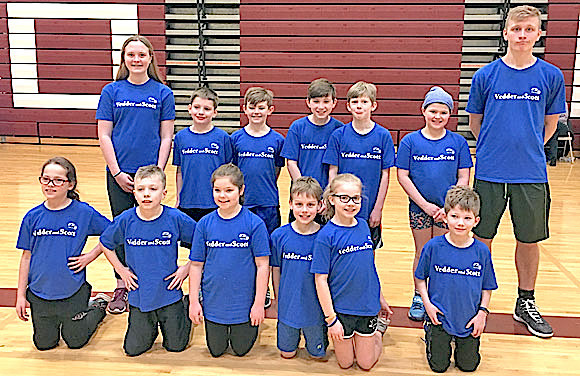 MARATHON, April 12, 2019 -- The Watkins Glen High School boys and girls varsity track teams competed Thursday in the 12-team Marathon Spring Fling High School Invitational at the Marathon Elementary School. First-place finishers for Watkins Glen were Max Evans in the High Jump (5' 10") and Gabe Planty in the 800 Meters (2:04.37). Haley Dean: 5th at 100 Meters (14.94) and 4th in the 200 Meters (30.36). The girls 4x100 relay team: 3rd in 59.95. The team was comprised of Haley Dean, Breanna Hayes, Madelyn Suddaby and Jena Slater. Jena Slater: 3rd in the Pole Vault (7' 6"). Jordan Avery: 6th in the 200 Meters (26.44). Max Evans: 6th in the 800 Meters (2:20.2). The boys 4x100 relay team: 6th in 54.94. The squad members were Collin Gaylord, Elliott Holland, Cale Sutterby and Nick Wilston. Nick Wilston: 6th in the Long Jump (17' 6.25 ") and 5th in the Triple Jump (34' 11"). Cale Sutterby: 6th in the Pole Vault (7 feet). Watkins Glen's Enkang Lin returns a volley in his doubles match. WATKINS GLEN, April 12, 2019 -- The Watkins Glen High School varsity tennis team lifted its season mark to 5-0 Thursday with a 6-1 victory over Trumansburg in an Interscholastic Athletic Conference match on the WGHS tennis courts. "We finished a long week of matches with a solid win today," said Watkins Glen Coach Scott Morse. "We played very well this week with three matches in three days. The team is working hard and playing very well. Hopefully, we can keep our momentum going after spring break." Photo in text: Watkins Glen's Kathleen Clifford awaits a serve. Left: Watkins Glen's Nate Wickham. Right: The Senecas' Jill Cantieni volleys. Watkins Glen's Hannah Morse reaches to return the ball in her doubles match. ITHACA, April 12, 2019 -- The Odessa-Montour High School boys varsity golf team's record slipped to 0-3 Thursday with a 259-289 loss to Newark Valley in an Interscholastic Athletic Conference match on the Hillendale Golf Course's par-35 front-9. Tyler Saunders led the Indians with a 45, while Noah Hollenbeck was just behind, with a 46. Austin Hoyt added a 59. Newark Valley, 2-2, was led by Billy Knight's 44. "We're showing signs of improvement," said O-M Coach Greg Gavich. The Owego goalkeeper makes a save on a shot by Watkins Glen's Avery Watson (6). Seneca teammate Dawson Wade (9) is in the background. WATKINS GLEN, April 12, 2019 -- The Watkins Glen High School varsity lacrosse team's record slipped to 1-4 Thursday when the Senecas dropped a 16-5 decision to Owego in a game on the WGHS athletic field. The Senecas, down 10-2 at the half, got three goals from Joe Chedzoy, and one each from Seamus Mooney and Brandon Beaumont. "It's good to play a tough team," said Watkins Glen Coach Nils Watson. "It shows us what we can do and where we need to improve." Photo in text: Watkins Glen's Dylan Markley (10) challenges an Owego ball carrier. Left: Watkins Glen's Joe Chedzoy moves the ball upfield, past a defender. Right: An Owego player sends a shot on goal that got past Watkins keeper Connor Novinsky (29). LANSING, April 12 2019 -- The Odessa-Montour High School varsity tennis team's record slipped to 1-4 Thursday when the Indians dropped a 7-0 decision to Lansing in an Interscholastic Athletic Conference match on the Lansing tennis courts. Lansing (3-2) won all four singles matches and the three doubles matches in straight sets. Competing in singles for O-M were Dylan Von Neida, Rhys Stermer, Sara Gardner and Brooke Sikora. Competing in doubles were the teams of Kaylea Simmons-Jacy Knapp, Cheianne Webster-Manuela Buffo, and Isabella Arlington-Shania Austin. WAVERLY, April 11, 2019 -- The Seneca Indians varsity baseball team dropped its third straight game Wednesday, falling to Waverly 20-7 in an Interscholastic Athletic Conference game on the Waverly baseball field. The 2-3 Seneca Indians -- a combined squad of Watkins Glen High School and Odessa-Montour athletes -- had defeated Waverly in the season opener at WGHS. But not this time. WG/OM -- a 4-3 winner in that opener -- built an early 3-0 advantage this time, but Waverly scored five runs in the bottom of the 2nd inning to take the lead, and added four runs in the 3rd inning, eight in the 4th, and three in the 6th. Waverly amassed 17 hits in the game, while the Seneca Indians had six. Sean Kelly went 2-for-4 for WG/OM with two doubles, two runs scored and an RBI. Johnny Niedermaier was 1-for-4 with a run scored and 2 RBIs. Austin Voorheis was 1-for-1 with a double, three walks, a run scored and an RBI, Other hits: a double by Hunter Holley and a single by Ben Mathews, each of whom scored a run. Isaac McIlroy started on the mound for the Seneca Indians, going three innings. Caleb Thomas pitched two innings, and Niedermaier one. Both teams struggled in the field, WG/OM committing eight errors and Waverly five. Watkins Glen's Hannah Morse has her eye on the ball as she volleys in a doubles match. She and Jill Cantieni won 6-0, 6-0. WATKINS GLEN, April 11, 2019 -- The Watkins Glen High School varsity tennis team defeated Union Springs 7-0 Wednesday in an Interscholastic Athletic Conference meet on the WGHS tennis courts. "The team played very well again today," said Watkins Glen Coach Scott Morse, whose squad is now 4-0. "I continue to see improvement throughout the team. It’s a great group of kids and it’s a pleasure to coach them! We play again tomorrow against Trumansburg at home and I’m hopeful we can continue to perform well." Photo in text: Watkins Glen's Nate Wickham catches up to a Union Springs volley in the No. 1 singles match. He returned it in play. Left: Watkins' Jonathon Hatch meets the ball. Right: The Senecas' Jill Cantieni volleys. Watkins Glen's Dylan Morse volleys. He won the No. 2 singles match, 6-1, 6-0. NEWARK VALLEY, April 11, 2019 -- The Watkins Glen High School boys varsity golf team's record slipped to 0-2 Wednesday when the Senecas dropped a 282-286 decision to Newark Valley in an Interscholastic Athletic Conference match on the Grandview Farms Golf Course. Georgio Fazzary led Watkins with a 50, while Ethan Cary fired a 52, Daniel Ely 57, and Andrew Hayes 58. Matt Waterman led NV with a 53. NEWFIELD, April 11, 2019 -- The Odessa-Montour High School varsity softball team improved to 3-1 Wednesday by defeating Newfield 12-8 in an Interscholastic Athletic Conference game on the Newfield softball field. O-M pitcher Grace Vondracek recorded 24 strikeouts thanks to some dropped third strikes. She posted 19 strikeouts that were actually outs, but five other batters reached first despite striking out -- in the 2nd inning (once), 5th inning (once), 6th inning (once) and 7th inning (twice). Coach Bill Lindlsley said the late-inning miscues -- dropped balls -- were the result of an injury to the regular catcher leading to a substitute who had no chance to warm up and had not caught Vondracek this year. The only Newfield outs that weren't strikeouts came on a grounder to second base in the first inning and a runner caught stealing in the 3rd inning. The Indians built a 12-1 lead through 4 1/2 innings, scoring three times in the 1st, twice in the 2nd and seven times in the 5th. Newfield rallied with two runs in the 5th, one in the 6th and four in the 7th, but fell short. Vondracek went the distance on the mound for O-M, allowing six hits while striking out those 24 batters and walking two. Just one Newfield run was earned. Vondracek was also 3-for-4 at the plate with a homer, triple, two runs scored and 4 RBIs. The Indians broke the game open with a seven-run 5th inning that saw RBIs from Vondracek, Lydia Lynch, Haley Landon, Madisyn Wells and Sam Sipes. Vondracek's homer was her fifth in four games. In addition to Vondracek's three hits, O-M got two from Lynch (with 2 RBIs and two runs scored) and one each from Isabel Foote, Sipes, Wells, Jolynn Minnier, Landon and Mackenzie Dundas. Rebecca Wolfe also had an RBI. The team had 10 stolen bases, including three by Lynch and two by Vondracek. Odessa returns to action Thursday at home against Marathon with the conclusion of a game started last week and currently tied, and a second complete game. WAVERLY, April 11, 2019 -- The Watkins Glen High School varsity softball team's record slipped to 1-3 Wednesday when the Senecas were blanked 18-0 by Waverly in an Interscholastic Athletic Conference game on the Waverly softball field. The contest, terminated after five innings under the so-called "mercy rule" that ends games when one team is ahead by 15 or more runs after five innings, saw Waverly score six runs in the 1st inning, one in the 2nd, eight in the 3rd and three in the 4th. Watkins Glen managed two hits -- by Claudia Parker and Katie Losey -- while Waverly amassed 16 hits. Parker went the distance on the mound for the Senecas, striking out six batters and walking eight. Wendi Hammond ptiched the first three innings for Waverly, striking out eight batters, and was 4-for-4 at the plate with a single, a triple and two homers, including a grand slam. The single in her second at-bat was her 100th career hit. Watkins Glen doubles player Enkang Lin volleys during Tuesday's match. WATKINS GLEN, April 10, 2019 -- The Watkins Glen High School varsity tennis team improved its record to 3-0 Tuesday when it defeated Newark Valley 5-2 in an Interscholastic Athletic Conference match on the WGHS tennis courts. The Senecas got victories in the 1st, 2nd and 3rd singles matches, with Nate Wickham winning 6-2, 6-4, Dylan Morse winning 6-0 6-0, and Clint Craven prevailing 6-0, 6-0. The 1st and 2nd doubles teams also won, Hannah Morse-Jill Cantieni posting a 6-1, 6-2 victory, and Ali LaMoreaux-Bryson Simmons registering a 7-6 (9-7), 6-1 victory. The Senecas' Jonathon Hatch lost in straight sets, while the doubles team of Kathleen Clifford-Enkang Lin lost a close three-set battle. "I was very happy with how the team played today," said Watkins Glen Coach Scott Morse. "Nate Wickham, Dylan Morse and Clint Craven continue to play very well in the first three singles. Our doubles teams were really good as well against some talented doubles teams. It was tricky with some gusting winds, but the kids stayed focused and dealt with it well. With matches tomorrow and Thurday (both at home), I'm hopeful we can keep our momentum and continue to play well." Photo in text: Watkins Glen doubles player Ali LaMoreaux on the way to a win. Left: Watkins Glen doubles player Bryson Simmons. Right: The Senecas' No. 1 singles player, Nate Wickham, on the way to victory. GROTON, April 10, 2019 -- The Odessa-Montour High School varsity softball team's record slipped to 2-1 Tuesday with a 6-4 loss to Groton in an Interscholastic Athletic Conference game on the Groton softball field. Odessa had fought back from a 1st inning 3-0 deficit -- an early uprising without a Groton hit -- to tie the game 3-3 in the top of the 6th on a solo homer by Grace Vondracek, her third homer in two games. Groton responded with three runs in the bottom of the inning for a 6-3 lead. O-M scored once in the top of the 7th, but the rally fell short. Vondracek took the loss on the mound, going six innings and allowing six runs, three earned, on five hits while striking out 11 batters and walking two. Odessa managed eight hits, with Vondracek going 2-for-4 with a homer, a run scored, a stolen base and an RBI. Isabel Foote went 2-for-4 with a double and an RBI, while four other players -- McKennah Lott, Lydia Lynch, Jolynn Minnier and Haley Landon -- had one hit each. Landon also had an RBI. O-M returns to action Wednesday at Newfield. Watkins Glen's Jordan Avery clears the High Jump bar. He placed third. WATKINS GLEN, April 10, 2019 -- The Watkins Glen High School boys and girls varsity track teams dropped Interscholastic Athletic Conference decisions Tuesday to Waverly in a meet on the WGHS athletic field. The Watkins boys fell 114-27, while the Watkins girls lost 125-16. Both Watkins squads had far fewer athletes than Waverly. --Haley Dean: 2nd in the 100 Meter Dash in 14.4. --Breanna Carl: 2nd in the 1500 Meters in 6:13.2. --Jena Slater: 1st in the Pole Vault at 7 6"
--Jordan Avery: 2nd in the 100 Meter Dash in 12.3. --Gabe Planty: 2nd in the 800 Meters in 2:08.7. --Gabe Planty: 1st in the 3200 Meters in 10:44. --Nick Wilston: 1st in the Long Jump at 18' 2.5"
--Nick Wilston: 2nd in the Triple Jump at 36' 6.5"
--Max Evans: 2nd in the High Jump at 5' 6"
Senior Night: The team's three seniors were honored before the meet: Jena Slater, Casen Weeden and Kai Sutterby. Sutterby was absent due to attendance at a HOSA (Future Health Professionals, formerly known as Health Occupations Students of America) event. Photo in text: Watkins Glen's Max Evans clears the High Jump bar. He placed second. Left: Watkins Glen's Gabe Planty. Right: Watkins Glen seniors Casen Weeden and Jena Slater, honored before the start of the meet at a Senior Night ceremony. Left: Watkins Glen's Jena Slater on the way to winning the Pole Vault. Right: The Senecas' Nick Wilston en route to first place in the Long Jump. Left: Watkins Glen's Breanna Carl. Right: The Senecas' Haley Dean. UNION SPRINGS, April 10, 2019 -- The Odessa-Montour High School varsity tennis team's record slipped to 1-3 Tuesday when the Indians dropped a 5-2 decision to Union Springs in an Interscholastic Athletic Conference road match. Odessa got wins from Rhys Stermer (6-1, 6-0 in the No. 2 singles) and Sara Gardner (6-1, 6-3 in the No. 3 singles), but lost the other two singles matches and all three of its doubles matches. With the victory, Union Springs improved to 2-1. Odessa-Montour returns to action Thursday at Lansing. O-M's Lydia Lynch is congratulated by teammates after hitting a 1st inning homer. ODESSA, April 9, 2019 -- The Odessa-Montour High School varsity softball team improved to 2-0 Monday with a 7-3 victory over Candor in an Interscholastic Athletic Conference game on the O-M softball field that saw the host team blast three homers. Two of those round-trippers were by Grace Vondracek in the 1st and 2nd innings, good for five runs. The third was by Lydia Lynch -- a 1st inning blast over the fence in left-center. Vondracek went the distance on the mound for Odessa, allowing three runs -- none of them earned -- on three hits while striking out 15 batters and walking one. -- Vondracek: 2-for-2 with two homers, two walks, three runs and 5 RBIs. -- Lynch: 2-for-3 with a walk, an RBI and a run scored. -- Isabel Foote: 2-for-4 with two runs scored. Odessa scored three runs in both the 1st and 2nd innings. After Candor scored three times in the 4th, O-M scored its last run in the bottom of that inning. Top: O-M's Grace Vondracek connects for a 1st inning homer. Bottom: Odessa 1st baseman Dezirae Minnier receives a throw from catcher Lydia Lynch, left, for a 1st inning putout. ... as Grace Vondracek hit a home run. Here, they both cross the plate. Odessa-Montour's Sam Sipes arrives safely at second base as a Candor throw gets away. WGHS senior Collin Baker signs a Letter of Commitment to SUNY Brockport, flanked by his mother Dawn and father Mike. Standing are sisters Caelin, left, and Carlie. 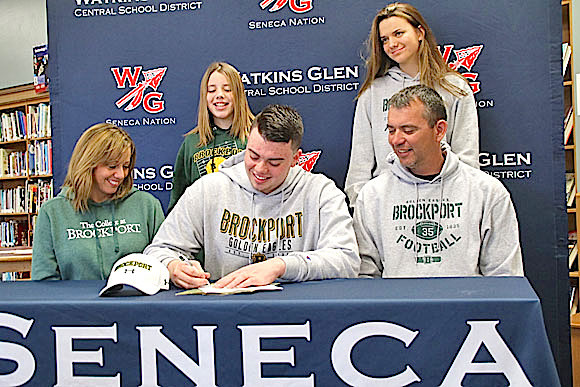 WATKINS GLEN, April 9, 2019 -- Watkins Glen High School seniors Collin Baker and Taylor Kelly held signing ceremonies Monday in the school library -- Baker signing a Letter of Commitment to SUNY Brockport, where he will play football and seek a degree in Criminal Justice; and Kelly a Letter of Intent to Corning Community College, where she plans to play basketball. Senior Hannah Morse was scheduled to sign with Kelly for CCC, but flu forced her absence. CCC Assistant Coach Michelle Wright said Morse can sign at a future ceremony. Coach Mike Wright said CCC was "ecstatic" to attract the duo of Kelly and Morse, who led the WGHS girls team to the New York State Class C championship basketball game this past season. Photo in text: Taylor Kelly, center front, was flanked by parents Amy and Randy Kelly. From left, back, are CCC coaches Michelle and Mike Wright, WGHS Coach Alicia Learn, and WGHS Assistant Coach Scott Morse. The Seneca Indians' Travis Hill dives back safely to first base on a pickoff throw. WATKINS GLEN, April 9, 2019 -- The Seneca Indians varsity baseball team's record slipped to 2-2 Monday when it dropped a 2-1 decision to Newark Valley in an Interscholastic Athletic Conference game on the Watkins Glen High School baseball field. The Seneca Indians -- a combined team of WGHS and Odessa-Montour athletes -- fell behind 2-0 in the 1st inning on a 2-run homer by NV's Evan Powell. They got within a run in the 5th, Austin Voorheis scoring on a single by Caleb Thomas, and threatened with two runners in the 6th. Those runners were stranded, though, and the three WG-OM batters in the 7th struck out. Derrick Lewis went the distance on the mound for the Seneca Indians, allowing just two hits, striking out 14 batters and walking three. Newark Valley's Michael Wandell allowed just one hit in five innings on the mound while striking out seven and walking seven. Joey Woodmansee allowed another hit and a walk, but struck out six batters in his two innings of relief. The Seneca Indians had their chances, stranding 10 runners, while the Cardinals stranded two. WG/OM returns to action Wednesday at Waverly. Top: The Seneca Indians' Derrick Lewis prepares to deliver a pitch. He allowed two hits. Bottom: An artistic renditon of a successful throw by WG/OM shortstop Isaac McIlroy to first base in the 6th inning. SPENCER, April 19, 2019 -- The Odessa-Montour boys and girls varsity track and field teams defeated Spencer-Van Etten Monday in an Interscholastic Athletic Conference meet on the S-VE athletic field. The O-M boys won 95-40, while the Odessa girls won 73-59. 100 Meter Dash: Deshawn Johnson, 12.4 seconds. 200 Meters: Deshawn Johnson, 25.6 seconds. Long Jump: Preston Harris, 18 feet. 400 Meter Run: William Yeater, 1:02. Discus: Zach Elliott, 134 feet. Shot Put: Zach Elliott, 49' 9"
Pole Vault: Andrew Hartford, 10 feet. Triple Jump: Paden Grover, 35' 2"
High Jump: Paden Grover, 5' 8"
110 Meter Hurdles: Preston Harris, 17.3. 100 Meter Dash: Nadia Simpson, 13.0 seconds. 200 Meters: Tori Brewster, 28.1 seconds. 800 Meters: Morgan Burnham, 2:59. Pole Vault: Kennedey Heichel, 8' 6"
A Newark Valley batter lays down a bunt single in the 1st inning in front of Watkins Glen catcher Madeline Parker. WATKINS GLEN, April 9, 2019 -- The Watkins Glen High School varsity softball team's record slipped to 1-3 Monday when the Senecas dropped a 16-0 decision to Newark Valley in an Interscholastic Athletic Conference game on the WGHS softball field. The game was terminated after six innings under the so-called "mercy rule" that ends games when one team leads by 15 or more runs after at least five innings. Newark Valley scored three runs in the 1st inning, two each in the 3rd, 4th and 5th innnigs, and seven runs in the 6th, amassing 14 hits along the way and playing errorless ball. Watkins Glen had two hits -- by Claudia Parker (1-for-3) and Katie Losey (1-for-2). Parker went the distance on the mound for the Senecas, striking out four batters, walking five and hitting two. "We hit the ball hard, but right at them," said Watkins Glen Coach Jim Scott, noting that his team struck out just five times. "They're a really good defensive team," he added. The Senecas return to action Wednesday at Waverly. Top: Watkins Glen's Kelsey Kernan catches a drive to center field. Bottom: The Senecas' Claudia Parker delivers a pitch. TRUMANSBURG, April 9, 2019 -- The Odessa-Montour High School boys varsity golf team slipped to 0-2 Monday when it fell to Trumansburg 285-296 in an Interscholastic Athletic Conference match on the Trumansburg Golf Course's par-36 back-9. Noah Hollenbeck, a junior, led Odessa with a career-low 44, while Tyler Saunders posted a 47. The Indians will return to action Thursday against Newark Valley at the Hillendale Golf Course. SCHUYLER COUNTY, April 7, 2019 -- A softball player, a field athlete and a lacrosse player are this week's Odessa File Athletes of the Week. Odessa-Montour's Grace Vondracek earns one of the nods for her 1-hit,19-strikeout softball masterpiece over Groton. She was also 4-for-4 at the plate. O-M's Zach Elliott earns one for his state-qualifying performances in the Discus and the Shot Put during the IAC Relays. And Watkins Glen's Joe Chedzoy earns the third for his six goals in two games, including a three-goal, three-assist effort that included the tying and winning goals in a comeback victory over Seton Catholic. Double Honorable: O-M track's Kennedey Heichel, Nadia Simpson, Paden Grover, Andrew Hartford, Ryan Griswold and Preston Harris; Watkins lacrosse's Connor Novinsky, Sam Smith and Avery Watson; Watkins softball's Claudia Parker; Watkins track's Haley Dean, Breanna Carl, Brianna Hayes, Kai Sutterby, Gabe Planty and Max Evans; and O-M tennis players Sara Gardner and Rhys Stermer. Honorable Mention: Another 54 athletes earned a point apiece in the ongoing poll that helps determine seasonal All-Stars and, ultimately, Athletes of the Year at each of the two schools covered. Odessa-Montour's Andrew Hartford clears 12 feet in the Pole Vault, a personal record. ODESSA, April 6, 2019 -- The Trumansburg boys and girls varsity track teams placed first Saturday at the Interscholastic Athletic Conference Relays on Odessa-Montour High School's athletic field. The Tburg boys totaled 114 points to runnerup O-M's 91. Leading Odessa was Zach Elliott, who met the state qualifying distances in both the Shot Put and Discus. He registered distances of 50' 6.5" in the Shot and 140' 11" in the Discus. Tioga placed third with 57 points, followed by Spencer-Van Etten (53), Newfield (50), Southern Cayuga (48), Union Springs (19), Moravia (9), and Watkins Glen (with only a few competitors, 7). The Tburg girls totaled 82 points to runnerup O-M's 62. S-VE was third with 56 points, followed by Union Springs (48), Southern Cayuga (42), Tioga (40), Moravia (35), Newfield (32), and Watkins Glen (23). --Preston Harris, Paden Grover, Andrew Hartford and Ryan Griswold won the Shuttle Hurdle Relay. --Deshawn Johnson and Preston Harris were second in the Long Jump with a combined 35 feet, 2 inches. --Paden Grover and Ryan Griswold were second in the Triple Jump with a combined 69 feet, 6 1/4 inches. --Paden Grover and Brock Sgrecci were first in the High Jump with a combined 11 feet. --Zach Elliott and Dylan Houseknecht were first in the Shot Put with a combined 88 feet, 6.5 inches. --Zach Elliott and Eric Rumsey were first in the Discus with a combined 263 feet, 5 inches. --The Shuttle Hurdle Relay team of Kennedey Heichel, Hannah Nolan, Hannah Bruno and Camille Sgrecci finished first. --Ida Sidle and Tori Brewster were second in the Long Jump with a combined 27 feet, 3.5 inches. --Tori Brewster and Hannah Nolan were third in the Triple Jump with a combined 59 feet, 3 3/4 inches. --Delaney Paulisczak and Kennedey Heichel were third in the High Jump with a combined 8 feet, 4 inches. --Kennedey Heichel and Camille Sgrecci were first in the Pole Vault with a combined 14 feet. --Leah Overhiser and Lexi Saunders were second in the Shot Put with a combined 47 feet, 3.5 inches. Top: O-M's Kennedey Heichel competes in the Shuttle Hurdle Relay, which her team won. Middle: Odessa's Delaney Paulisczak clears the bar in the High Jump. Bottom: O-M's Paden Grover lands in the Triple Jump pit. He and teammate Ryan Griswold placed second in that event. Left: Watkins Glen's Maddie Suddaby goes airborne in the Triple Jump. Right: Watkins Glen's Kai Sutterby. From left: O-M's Reagan Bishop, Hannah Bruno and Morgan Burnham. Left: O-M's Camille Sgrecci in the Shuttle Hurdles. Her team (Kennedey Heichel, Hannah Nolan and Hannah Bruno) placed first. Right: O-M's Zach Elliott prepares to launch the Shot. He hit the state qualifying distance in the Shot and the Discus. From left: Watkins Glen's Jena Slater, O-M's Ida Sidle, Odessa's Leah Overhiser. Left: O-M's Lexi Saunders. Right: Odessa's Ryan Griswold on the way to victory in the Shuttle Hurdles. Other members of his team: Preston Harris, Paden Grover and Andrew Hartford. Left: Odessa-Montour's William Yeater. Right: Watkins Glen's Elliott Holland. Left: Taking a break during the track meet. Right: O-M's Ida Sidle goes airborne. The ball was up for grabs as members of both teams congregated near midfield. WATKINS GLEN, April 5, 2019 -- The Watkins Glen High School varsity lacrosse team rallied with four goals in the fourth quarter to overtake Seton Catholic 9-8 Thursday for its first win of the season. The 1-3 Senecas, trailing most of the game on their home turf, rode three goals by Joe Chedzoy -- including the game-tying and game-winning scores -- to the victory. Also scoring were Sam Smith (twice), Avery Watson, Dawson Wade, Ramel Fulcher and Seamus Mooney. Chedzoy also registered three assists. Connor Novinsky made 14 saves in goal for the Senecas. "He has been a great addition to the team this season," said Watkins Glen Coach Nils Watson, noting that Novinsky "has over a 50% save percentage, great for a lacrosse goalie." The team, added Watson, "played a better game today. We were more composed than in previous games this season. Our passing was better and the defense did a good job of shutting down shooting opportunities." Watkins Glen struck first with a goal by Chedzoy at 11:18 of the first period, but Seton scored the next three goals, and entered the second quarer ahead 3-1. Goals by Smith and Watson at 11:02 and 9:42 of the second period evened the score at 3-3, but Seton moved ahead again with two goals before intermission for a 5-3 halftime lead. The Seton lead grew to three, at 6-3, with 8:33 left in the third quarter, but Watkins Glen responded with goals by Dawson and Fulcher at 8:03 and 5:49 of the third period to cut the deficit to 6-5. The teams then alternated goals, Seton going up 7-5 at 3:01 of the third period, Watkins closing to within 7-6 on Smith's second goal at 11:27 of the fourth period, and Seton going up by two, 8-6, at 9:44 of the fourth. Then came the late Watkins surge, with Mooney scoring at 9:16 to cut the Seton lead to 8-7, followed by Chedzoy goals at 7:05 to tie the game and at 2:02 to put the Senecas ahead for good. That goal saw Chedzoy take the ball deep in the Watkins end of the field, race up the left sideline and fire in a shot from an angle to the left. Watkins Glen then managed to run out the clock. Top: Watkins Glen's Joe Chedzoy attempts a shot on goal in traffic. Bottom: The Senecas' Avery Watson cuts loose with a shot that found the net and tied the game 3-3 in the second quarter. Watkns Glen's Dawson Wade takes a shot on goal. The Seton keeper stopped it. Left: Watkins Glen's Sam Smith, left, is congratulated by teammate Dylan Markley after scoring his first goal of the game. Right: The Seneca's Ramel Fulcher (4) scored a goal. Left: Watkins' Dylan Markley fires high, just over the net. Right: The Senecas race out on the field to congratulate goalkeeper Connor Novinsky and celebrate with him. Watkins Glen's Joe Chedzoy (5) sustained two fouls that put him on the turf in the final minute of play. The two Seton players pictured were both called for penalties. Left: Watkins Glen goalkeeper Connor Novinsky is seemingly staring down a Seton shot on goal. Right: The Senecas' Dawson Wade, left, battles for possession of the ball. ITHACA, April 5, 2019 -- The Odessa-Montour High School boys varsity golf team dropped its season opener Thursday to Groton, 271-296, in an Interscholastic Athletic Conference match on the Hillendale Golf Course's par-35 front-9. "All in all not bad for the first boys match in two years," said O-M Coach Greg Gavich. There were not enough players last year for an O-M boys team. This year, there is no girls team, with Starkweather joining the boys squad. TRUMANSBURG, April 5, 2019 -- The Watkins Glen High School boys varsity golf team lost its season opener Thursday to Trumansburg, 298-307, in what Coach John Fazzary called "tough, cold conditions" at the Trumansburg Golf Course. Georgio Fazzary led the Senecas with a 51, while Ethan Cary shot a 57, Daniel Ely 62, Andrew Hayes 65, and Demitrius Dillon 72. Elizabeth Dawson and Owen Leiter led Trumansburg, each with a 51. Watkins pitcher Claudia Parker tags out a Dryden runner trying to score from third base after a pitch got past catcher Katie Losey, who retrieved the ball and threw to Parker. WATKINS GLEN, April 4, 2019 -- The Watkins Glen High School varsity softball team's record slipped to 1-2 Wednesday when the Senecas dropped an 18-3 decision to Dryden in an Interscholastic Athletic Conference game on the WGHS softball field. The Senecas trailed 6-0 in the 5th inning when they loaded the bases and Nancy Jackson drove the ball to deep centerfield with two outs -- a potential 3-run triple. But the Dryden centerfielder snagged the ball with full extension over her shoulder while on the run to quell the uprising. "Doggone it," said Watkins Glen Coach Jim Scott. "That would've changed the whole dynamic. I'm not saying we would have won, but we were playing pretty good" at that point -- having held the Lions scoreless over the previous two innings. But after that, the wheels came off. Several misplays in the field opened the floodgates, and Dryden scored seven runs in the 6th inning and five in the 7th. The Senecas finally got on the board in the 7th inning, scoring three times on three hits. Watkins Glen managed eight hits in the game, compared to Dryden's 16. The Senecas committed five errors to Dryden's one. Claudia Parker went the distance on the mound for Watkins, striking out eight batters and walking two. She also had three of her team's hits, going 3-for-4 with a run scored. Other hits came from Kelsey Kernan (1-or-4), Katie Losey (1-for-4 with a run scored and an RBI), Jackson (1-for-4 with an RBI), Cierra Barber (1-for-2), and Maggie Rhoads (1-for-2). The Senecas return to action Friday at home against Elmira Notre Dame. Top: Watkins Glen's Kelsey Kernan is called out at first in a bang-bang play that followed her grounder to the Dryden second baseman. Bottom: The Senecas' Hayley Cornish was wrapped in a blanket (to ward off a strong and chilling wind) and sunglasses. Watkins Glen's Cierra Barber sends the ball toward short left field, where the Dryden shortstop (right) tried in vain to catch it. Left: Watkins Glen's Maggie Rhoads swings. She connected a moment later for a single. Right: The Senecas' second baseman, Madyson Simpson, catches an incoming throw as a Dryden runner slides safely into second. Left: Watkins Glen's Nancy Jackson connects with the bases loaded and two out in the 5th inning. Right: The Dryden centerfielder hauls in Jackson's drive on the run. CAMPBELL, April 4, 2019 -- The Watkins Glen High School girls varsity track team edged Campbell-Savona 59-58 Wednesday in a non-league meet on the C-S athletic field. The Watkins boys team fell to C-S, 75-60. "It was a very cold night, but the ladies did a great job participating in extra events outside their comfort zone in order to get the win," said Watkins Glen Coach Rod Weeden. In the boys meet, he said, "we lost by not having a full, healthy team. Just two event changes would have made the difference." Long Jump: 1st Brianna Hayes 12' 2", 3rd Madelyn Suddaby 11' 2"
Triple Jump: 1st Brianna Hayes 25' 1/2", 3rd Maya Somerville 22' 5"
Discus: 1st Collin Gaylord 70' 5"
Shot Put: 2nd Collin Gaylord 24' 0"
Triple Jump: 1st Nick Wilston 34' 3", 2nd Tim Clifford 31' 0"
High Jump: 1st Max Evans 5' 0", 2nd Jordan Avery 4' 9"
Pole Vault: 2nd Cale Sutterby 6' 6"
Long Jump: 2nd Nick Wilston 16' 2", 3rd Max Evans 14' 1.5"
MARATHON, April 4, 2019 -- The Odessa-Montour High School girls varsity softball team's Interscholastic Athletic Conference game against Marathon was called after five innings Wednesday because of darkness with the score tied 7-7. The contest will be concluded on April 11th, when Odessa hosts Marathon for another game. Marathon scored first, building a 3-0 lead in the 1st inning. After Odessa tied the game with three runs in the 3rd (including a home run by Grace Vondracek), Marathon regained the lead 4-3 in the bottom of the 3rd. O-M struck for four runs in the top of the 5th to take a 7-4 lead, only to see Marathon tie it in the bottom half of the frame. Vondracek (2-for-3 with a run scored and an RBI) and Isabel Foote (2-for-3 with 2 RBIs) led the O-M offense. Other hits came from Jolynn Minnier (1-for-2 with two runs scored) and Haley Landon (1-for-2 with a walk and an RBI). Emma Lodge also scored once and drove in a run. Lydia Lynch, Dezirae Minnier and Madisyn Wells also scored a run each. Vondracek pitched all five innings for Odessa, allowing five earned runs on seven hits while striking out eight batters and walking three. DRYDEN, April 4, 2019 -- The Seneca Indians varsity baseball team sustained its first loss of the season Wednesday when it dropped a 9-7 decision to Dryden in an Interscholastic Athletic Conference game on the Dryden baseball field. The Seneca Indians -- a combined team of Watkins Glen High School and Odessa-Montour athletes -- scored a run in the top of the 1st inning, but Dryden went ahead 2-1 in the bottom of the inning. Each team scored again in the 3rd, and after WG/OM scored three times in the 4th and Dryden scored twice in the same frame, the game was tied 5-5. A three-run 5th inning put Dryden up 8-5, and after the Seneca Indians closed to within a run, 8-7, in the top of the 6th, Dryden closed out the scoring with a run in the bottom of the inning. WG/OM registered five hits to Dryden's nine. Hunter Holley had a double, while Isaac McIlroy, Caleb Thomas, Josiah Wysocki and Ben Mathews each registered a single. Both teams struggled in the field, with the Seneca Indians committing eight errors, and Dryden committing six. Austin Voorheis went the distance on the mound for WG/OM, allowing nine runs -- but only two earned -- on nine hits while striking out five batters and walking none. MORAVIA, April 3, 2019 -- The Odessa-Montour High School varsity tennis team improved to 1-2 Tuesday by defeating Moravia 5-2 in an Interscholastic Athletic Conference match on the Moravia tennis courts. Posting wins in singles for O-M were Rhys Stermer, 6-3, 6-2, and Sara Gardner, 6-0, 6-1. Posting wins in doubles were the Odessa teams of Dana Zimmers-Cheianne Webster, 7-5, 3-6, 6-4; Jacy Knapp-Kaylea Simmons, 6-3, 6-4; and Manuela Buffo-Malia Mertens, 6-0, 6-0. The Indians lost two singles matches to 0-3 Moravia, with Dylan Von Neida falling in three sets and Brooke Sikora losing in two. AURORA, April 2, 2019 -- The Watkins Glen High School varsity tennis team improved to 2-0 Tuesday with a 7-0 victory over Southern Cayuga in an Interscholastic Athletic Conference match on the Southern Cayuga tennis courts. "The entire team played very well tonight," said Watkins Glen Coach Scott Morse. "It was a solid effort at every position." In singles, Nate Wickham won 6-1, 6-3, Dylan Morse won 6-1, 6-4, Clint Craven won 6-2, 6-0, and Mathew Sandritter won 6-0, 6-0. In doubles, Hannah Morse-Jill Cantieni won 5-7, 6-2, 6-3, Ali LaMoreaux-Bryson Simmons won 6-0, 6-2, and Kathleen Clifford-Enkang Lin won 6-1, 6-0. SOUTHPORT, April 3, 2019 -- The Watkins Glen High School varsity lacrosse team's record slipped to 0-3 Tuesday when the Senecas dropped an 8-7 decision to Elmira Notre Dame in a game on the ND athletic field. Joe Chedzoy scored three goals for Watkins Glen, while Avery Watson scored two goals and Seamus Mooney and Sam Smith one each. Connor Novinsky registered 14 saves in goal for the Senecas. "We had the lead in the game until 5:59 left in the fourth quarter," said Watkins Glen Coach Nils Watson. "Turnovers and mistakes once again cost the team a win. Until we can possess the ball, we will continue to suffer." The Senecas return to action Thursday at home against Seton Catholic. ODESSA, April 2, 2019 -- The Odessa-Montour High School varsity softball team -- led by Grace Vondracek's pitching and hitting -- defeated Groton 10-0 Monday in an Interscholastic Athletic Conference season-opener on the O-M softball field. Vondracek allowed just one hit while striking out 19 batters and went 4-for-4 at the plate as the Indians topped Groton with a 16-hit attack. Groton's lone hit, a single, came in the 6th inning. O-M scored four runs in the 3rd inning, two in the 4th, one in the 5th and three in the 6th. In addition to Vondracek's four hits (one of them a triple), Odessa got three hits from Jolynn Minnier -- including a triple and a homer -- and two each from Dezirae Minnier, Madisyn Wells and Isabel Foote. Other hits came from Sam Sipes, Lydia Lynch and Rebecca Wolfe. Jolynn Minnier drove in three runs, Vondracek two, and Lynch, Wolfe and Wells one apiece. Foote and Vondracek each stole two bases, and Jolynn Minnier and Lynch one each. O-M returns to action Wednesday at Marathon. Photo in text: Odessa-Montour pitcher Grace Vondracek. Left: O-M's Lydia Lynch connects with a pitch. Right: O-M's Isabel Foote with her batting helmet in hand. Left: Watkins Glen pitcher Claudia Parker. Right: Watkins rightfielder Jeanette Rodriguez hauls in a fly ball in the 7th inning. WATKINS GLEN, April 2, 2019 -- The Watkins Glen High School varsity softball team evened its season mark at 1-1 Monday with a 16-5 victory over Whitney Point in an Interscholastic Athletic Conference game on the WGHS softball field. 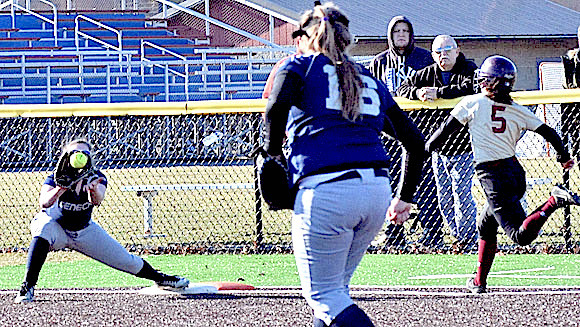 The Senecas, who failed to win a game last year, scored nine runs in the first three innings and coasted from there, adding two runs in the 4th and five in the 5th. Whitney Point scored single runs in the 4th, 5th and 7th innings, and two runs in the 6th. Claudia Parker went the distance on the mound for Watkins Glen, allowing six hits while striking out eight batters and walking three. She was also 3-for-5 at the plate with a double, two runs scored and 2 RBIs. Kelsey Kernan was 2-for-3 for the Senecas with a triple, three runs scored and three RBIs. Katie Losey was 2-for-4 with two runs and two RBIs, while Cammi McCarty was 1-for-3 with a run scored and two RBIs. "It was a great win," said Watkins Glen Coach Jim Scott. "The girls are happy, and I'm happy for them." The Senecas return to action Wednesday at home against Dryden. Top: Watkins Glen's Kelsey Kernan rounds second base on her way to a triple after driving the ball to deep centerfield. (Photo by Sheila Barber) Right: Seneca teammates Madyson Simpson, left, and Cammi McCarty celebrate the win. The ball gets by the Whitney Point first baseman off a throw that followed an infield grounder by Watkins Glen's Nancy Jackson, left, who advanced to second on the play. 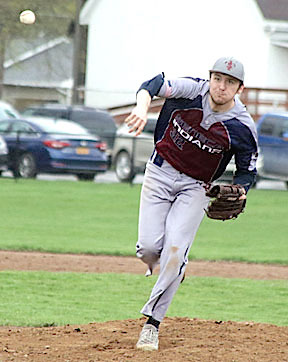 WATKINS GLEN, April 2, 2019 -- The Seneca Indians varsity baseball team improved to 2-0 Monday with a 7-5 victory over Whitney Point in an Interscholastic Athletic Conference game on the Watkins Glen High School baseball field. The Seneca Indians -- a combined team of WGHS and Odessa-Montour High School athletes -- built a 3-0 lead in the 1st inning before Whitney Point scored twice in the 2nd. WG/OM extended the lead to 5-2 in the 3rd, and to 6-2 in the 5th, but the Eagles pulled close, 6-5, with a three-run 6th inning. The Seneca Indians added an insurance run in the bottom of the 6th on a walk, a bunt single, a throwing error that put runners on second and third, and a wild pitch. Isaac McIlroy pitched the first four innings for WG/OM, allowing two runs on four hits while striking out three batters and walking five. Caleb Thomas pitched the final three innings, allowing three runs (two earned) on two hits while striking out two batters and walking one. The Seneca Indians registered six hits. Kelly went 2-for-4 with a run scored, Derrick Lewis 1-for-4 with a run scored, Austin Voorheis 2-for-2 with two runs scored, an RBI and a walk, and Johnny Niedermaier 1-for-3 with two RBIs. Caleb Thomas walked once and scored twice, while Steven Gublo walked once and scored the final run. Top: The Seneca Indians' Caleb Thomas delivers a pitch. Bottom: OM/WG's Steven Gublo dives back safely to first base on a pickoff play. From left: Seneca Indians second baseman Hunter Holley throws out a runner; first baseman Johnny Niedermaier; and shortstop Isaac McIlroy squeezes a pop fly. ODESSA, April 2, 2019 -- The Odessa-Montour High School boys and girls varsity track teams defeated Newfield Monday in an Interscholastic Athletic Conference track-and-field season opener on the O-M athletic field. The O-M boys posted a 99-37 victory, while the O-M girls won 98-33. Watkins Glen also competed, but not for a competitive team score. On the girls' side, Odessa got wins from Kennedey Heichel in the 100 Hurdles (17.7) and 400 Hurdles (1:16.2); Nadia Simpson in the 100 (13.3) and 200 (27.6); Morgan Burnham in the 800 (2:57.8); Autumn Garrison in the Discus (52'4"); Lexi Saunders in the Shot Put (26' 7.75"); Hannah Bruno in the Long Jump (14' 7.75"); and Tori Brewster in the Triple Jump (30' 1/2"). It also had wins in the 4x100 and 4x400 Relays. On the boys' side, O-M wins came from Preston Harris in the 110 Hurdles (17.9) and 400 Hurdles (1:06.1); Deshawn Johnson in the 100 (12.4); Noah Brewster in the 400 (57.5); Will Yeater in the 3200 (12:32.1); Zach Elliott in the Discus (139' 2") and Shot Put 47' 11.75"); and Paden Grover in the Long Jump (17' 7"), Triple Jump (36' 6") and Pole Vault (7' 6"). It also had a win in the 4x100 Relay. Watkins Glen wins were posted by Breanna Carl in the 1500 (6:13.3) and 3000 (13:45); Gabe Planty in the 1600 (4:47); Jordan Avery in the 200 (25.4); Max Evans in the High Jump (5'6"), and Jena Slater in the Pole Vault (7'). It also won the 4x400 Relay. Photo in text: Odessa-Montour's Deshawn Johnson at the start of the 100, which he won. From left: O-M's Lexi Saunders and Watkins Glen's Breanna Carl and Gabe Planty. Left: O-M's Victoria Brewster competes in the Long Jump. She won the Triple Jump. Right: Odessa's Preston Harris goes airborne in the Long Jump. ODESSA, April 2, 2019 -- The Odessa-Montour High School varsity tennis team's record slipped to 0-2 Monday when the Indians dropped a 4-3 decision to Waverly in an Intersholastic Athletic Conference match on the O-M tennis courts. The Indians' No. 1, 2 and 3 singles players -- Dylan Von Neida, Rhys Stermer and Sara Gardner -- posted victories, Von Neida 6-2, 6-7 (5-7), 6-1 over Seth Lloyd, Stermer 6-0, 7-6 (7-4) over Collin Keefer, and Gardner 6-0, 6-1 over Caleb Wilcox. The three O-M doubles teams -- Brooke Sikora-Isabella Arlington, Jacy Knapp-Kaylea Simmons and Dana Zimmers-Malia Mertens -- sustained losses, as did the No. 4 singles player, Cheianne Webster. With the win, Waverly improved to 1-1. Photo: Odessa-Montour's Rhys Stermer volleys. He won his match. SCHUYLER COUNTY, April 1, 2019 -- Two members of the Seneca Indians baseball team are The Odessa File Athletes of the Week. They are pitcher-catcher Derrick Lewis and centerfielder-pitcher Caleb Thomas. Each pitched and each had an RBI hit -- and each made an important defensive play -- as the Seneca Indians (the combined Watkins Glen High School/Odessa-Montour varsity baseball team) defeated Waverly in the season opener, 4-3. Double Honorable: Seneca Indians Johnny Niedermaier and Hunter Holley; Watkins Glen lacrosse players Joe Chedzoy and Avery Watson. Honorable Mention: Another 10 athletes earned a point apiece in the ongoing poll that helps determine seasonal All-Stars and, ultimately, Athletes of the Year at each of the two schools covered. WATKINS GLEN, March 30, 2019 -- The Watkins Glen High School varsity softball team opened its season with a loss Friday, failing to get a hit in a 15-0, five-inning Interscholastic Athletic Conference loss to Waverly on the WGHS softball field. The Senecas retired Waverly in order in the first inning, but after that the Wolverines scored seven runs in the 2nd, two in each of the 3rd and 4th, and four in the 5th -- triggering the so-called "mercy rule" that terminates games after five innings if one team leads the other by 15 or more runs. Pitchers Wendi Hammond and Hali Jenner combined for the no-hitter for Waverly, which garnered eight hits off Watkins Glen hurler Claudia Parker (who struck out four batters and walked four). The Senecas committed five errors, while Waverly played errorless ball. Watkins Glen returns to action Monday at home against Whitney Point. Photo in text: A Waverly runner is safe at home as Watkins Glen catcher Katie Losey applies a tag. Left: Watkins Glen's Cierra Barber hauls in a throw to first base. Right: The Senecas' pitcher, Claudia Parker. The Seneca Indians' Caleb Thomas connects for an RBI triple in the 3rd inning. WATKINS GLEN, March 30, 2019 -- The Seneca Indians varsity baseball team built a 2-0 lead, fell behind in the 6th inning, and then rallied to defeat Waverly 4-3 Friday in an Interscholastic Athletic Conference season opener on the Watkins Glen High School baseball field. The Senecas, behind the strong pitching of Derrick Lewis, built a 2-0 lead through five innings, its runs coming on an RBI triple by Caleb Thomas and an RBI single by Lewis in the 3rd inning. Waverly struck for three runs in the top of the 6th triggered by an error and featuring an RBI double and two RBI singles, but WG/OM responded in the bottom of the inning with two runs on an RBI single by Johnny Niedermaier and an RBI groundout to the right side of the infield by Hunter Holley. Holley, the Seneca Indians' second baseman, finished matters off in the 7th inning by hauling in a soft Waverly fly to short rightfield, sending the WG/OM players -- a combined squad of WGHS and Odessa-Montour athletes -- into a brief celebration. The Seneca Indians registered five hits as Thomas went 1-for-3 with a run scored and an RBI; Lewis 1-for-2 with a run scored, an RBI and a walk; Austin Voorheis 1-for-3 with a run; and Niedermaier 2-for-3 with an RBI. Sean Kelly walked once and scored a run. Lewis went five innings on the mound, and part of the 6th, allowing three runs (one earned) while striking out eight batters and walking three. Thomas secured the final six outs, allowing two hits while striking out one and walking one. Key defensive plays included a long running catch in right center by centerfielder Thomas; a nifty scoop by Niedermaier on a putout at first; a sinking liner snagged by Holley with the bases loaded and two outs; and a putout at home, with Lewis -- who took over catching duties after concluding his pitching stint -- applying the tag on a close play. Top: The Seneca Indians' Sean Kelly slides home safely in the 3rd inning. Bottom: WG/OM's starting pitcher, Derrick Lewis. Left: The Seneca Indians celebrate their victory. Right: WG/OM second baseman Hunter Holley exults after catching a pop fly for the final out. Seneca Indians shortstop Isaac McIlroy fires to first after fielding a grounder. BINGHAMTON, March 30, 2019 -- The Watkins Glen High School varsity lacrosse team's record slipped to 0-2 Friday when the Senecas dropped an 8-5 decision to Seton Catholic on the road. Avery Watson and Seamus Mooney each scored two goals for the Senecas, while Joe Chedzoy had one. Connor Novinsky registered 16 saves in goal. "We were our own opponent this afternoon," said Watkins Glen Coach Nils Watson. "We missed passes and dropped balls," and "poor groundball work hurt us." The Senecas return to action Tuesday at Elmira Notre Dame. SENECA FALLS, March 28, 2019 -- The Watkins Glen High School varsity lacrosse team started its season with a loss Wednesday, falling 17-5 to Mynderse Academy on the road. Joe Chedzoy led the Senecas with four goals, and won 14 face-offs. Avery Watson scored the other goal, while Connor Novinsky registered nine saves in goal. Nate VanAmburg had three face-off wins. "Little errors hurt the team today," said Watkins Glen Coach Nils Watson. "I'm not sure if it was first-game nerves or what, but dropped balls and bad passing caused many turnovers." The Senecas return to action Friday at Seton Catholic. Game time is 5 p.m.
Odessa-Montour's Sara Gardner volleys on the way to a victory in singles. ODESSA, March 27, 2019 -- The Odessa-Montour High School varsity tennis team dropped a 6-1 decision to Edison Tuesday in a season-opening Interscholastic Athletic Conference match on the O-M tennis courts. Sara Gardner posted O-M's lone victory, defeating Edison's Ben Doland 6-4, 6-2 in the 3rd Singles match. Odessa lost its other matches in straight sets. Dylan Von Neida, Rhys Stermer and Cheianne Webster lost in the 1st, 2nd and 4th Singles matches, while O-M's Brooke Sikora-Shania Austin, Jacy Knapp-Kaylea Simmons and Malia Mertens-Dana Zimmers fell in the 1st, 2nd and 3rd Doubles matches, respectively. Left: O-M's Cheianne Webster volleys. Right: Odessa's Rhys Stermer prepares to serve. LANSING, March 27, 2019 -- The Watkins Glen High School varsity tennis team opened its season with a win Tuesday, defeating Lansing 4-2 in an Interscholastic Athletic Conference match on the Lansing tennis courts. Watkins Glen won all three of its singles matches and one doubles. The 4th Singles was called off "due to lateness (8:40) after Watkins Glen won the 4th point" to secure the victory, said WGHS Coach Scott Morse. Posting wins for Watkins in singles were Nathaniel Wickham (0-6, 6-0, 7-5), Dylan Morse (6-4, 7-5) and Clint Craven (6-0, 6-3). Winning in doubles: Kathleen Clifford and Enkang Lin (3-6, 6-4, 6-2). Falling in doubles were the Seneca teams of Hannah Morse-Jill Cantieni and Ali LaMoreaux-Jonathan Hatch. "It was an interesting night," said Coach Morse. "It was cold and breezy, and minutes into the match the post holding the net on court 2 (of only three) broke off, making the court impossible to use. With only two courts in use for seven matches, it got dark and colder as the evening progressed. "I was very pleased with my singles players, and the third doubles team of Clifford and Lin fought back after losing the first set to secure the final point. We obviously have plenty of work to do, but I'm happy with the effort and excited for this season with a terrific group of kids to work with." Watkins Glen goalkeeper Conner Novinsky, right, makes a save on a Newark shot. WATKINS GLEN, March 21, 2019 -- The Watkins Glen High School varsity lacrosse team scrimmaged Newark High School's team Thursday at home in preparation for the start of the regular season. Watkins Coach Nils Watson said he was pleased with his team's performance -- it was outplaying Newark -- and said the squad is improved with the addition of more experienced players than it has had in the past. The first official game is scheduled for March 27 at Mynderse Academy in Seneca Falls. Game time is 4:30 p.m.
Photo in text: Watkins Glen's Dylan Markley (10, left) prepares to unleash a shot that resulted in a goal. The Watkins Glen girls varsity basketball team poses after returning home from the NYSPHSAA Final Four in Troy. 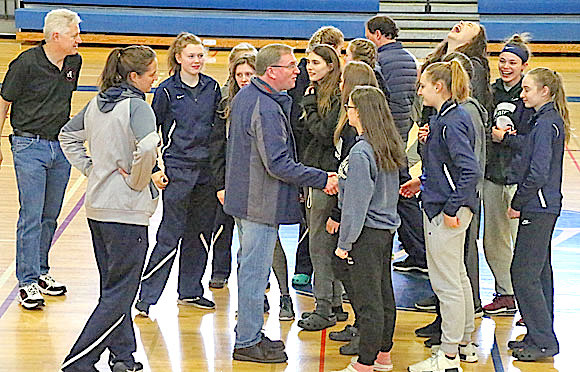 WATKINS GLEN, March 17, 2019 -- Scores of family, friends and admirers were waiting for the Watkins Glen High School girls varsity basketball team upon its return home Sunday morning from its second-place finish in the New York State Public High School Athletic Association Final Four at Hudson Valley Community College. The girls, though tired and disappointed by their title-game loss, smiled and posed for photos and accepted congratulations for a phenomenal season. Cambridge defeated the Senecas, 57-43, in the championship game Saturday night. "This is a great team," Coach Alicia Learn told the crowd. "We had lots of great times." The team stayed overnight in Troy after the game, departing for home around 7 a.m. Sunday and arriving -- accompanied by Watkins Glen and Hector fire trucks and sirens -- at the WGHS Field House at around 11:15. Top: From left, team standouts Danielle Leszyk, Hannah Morse and Taylor Kelly pose with the State Tournament Finalist plaque they brought back from Troy. Bottom: Coach Alicia Learn addresses the crowd in the Field House. Well-wishers who greeted the team upon its arrival outside filed into the Field House for speeches and photos. Watkins Glen Schools Superintendent Greg Kelahan congratulates the Senecas during Sunday's gathering in the WGHS Field House gym. Watkins Glen's Adrienna Solomon inbounds the ball as Cambridge's Fiona Mooney leaps. TROY, March 17, 2019 -- The disappointment was etched on their faces, and in the tears falling down the cheeks of a few of them. 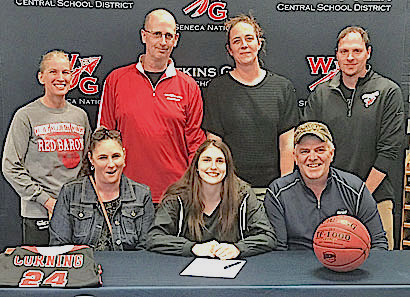 The Watkins Glen High School girls varsity basketball team walked off the court Saturday night without the prize they had coveted -- the New York State Public High School Athletic Association Class C championship. That went instead to Cambridge -- located about an hour from the tournament site: Hudson Valley Community College in Troy. The seore was 57-43, which belied how close the game was through three quarters. As in many close games, late fouls to try and stem the tide worked in favor of the team being fouled. Cambridge converted 6 of 10 such shots in the closing 1:12 to ice the game and the title. Any number of bad things can turn the tide: fouls called early against one of your key players, cold shooting, a hot team with a propensity for disupting their opponents' rhythm, and uneven crowd support. That's why home-court is an advantage. In this case, Watkins Glen's Taylor Kelly was whistled in the first 16 seconds, and was pulled with 2:16 left in the first period when she was called for a second foul. She didn't return until the second half. The cold shooting came, oddly enough, upon her return. She could no longer find the range (after hitting two 3-pointers in the first period), and Danielle Leszyk likewise was struggling to find the cylinder after scoring all 11 of her points in the first half, including three 3-pointers. Drives up the lane were met with heavy traffic and the long, long arms of Cambridge's Phillips sisters, Lilly and Sophie. Even so, somehow -- largely thanks to its own defense -- Watkins Glen (down 32-31 at halftime) stayed close, closing a 40-35 deficit with 3:11 left in the third quarter down to 41-39 at the end of the period. Cambridge -- a very hot team with 22 straight wins and only one loss all season -- extended the lead to 44-39 at 5:36 of the fourth quarter and then to 50-39 two minutes later on a two-pointer, a free throw and a 3-pointer. Kelly scored and converted a free throw at 1:54 to cut the deficit to eight points, 50-42, but any thoughts of a miracle comeback like the one that carried the Senecas to the title two years earlier (overcoming a 16-point deficit in the final period) evaporated as Cambridge scored, as it had all night, on a layup. The Indians were proficient on the offensive board, and it cost the Senecas repeatedly. From there, the foul shots granted Cambridge widened the gap to the final 14-point spread. Leszyk and Adrienna Solomon led Watkins scorers with 11 points each, while Kelly registered 10 points, Morse 9, and Kelsey Kernan 2. The team was 3-for-4 from the foul line. Cambridge converted 12 of 19 free throws as two Watkins players -- Kernan and Solomon -- fouled out while Kelly and Morse each had four fouls. As for the crowd, Watkins Glen attracted a sizable contingent that drove the three-and-a-half hours to cheer on their team, but Cambridge had twice as many fans, filling the bleachers across the gym from Watkins Glen's. It looked a bit like Santa Anna's trooops as they massed to attack the Alamo. The noise level at times was as unnerving as when Santa Anna's troops played "No Quarter' before attacking. But it was the Cambridge players themselves who got it done -- a defensive minded squad with the Phillips twins reaching very high to swat away several shots, forcing the Senecas to a long-ball attack that just wasn't working on this night -- at least after intermission. Watkins finished with six 3-pointers, all in the first half. --Leszyk and Morse were named to the All-Tournament team, which included Cambridge's Phillips sisters and Millbrook's Erin Fox. Solomon received a Sportsmanship Award. --The Senecas were staying the night in a Marriott hotel, and returning by bus this morning (Sunday), with arrival home expected about noon. Top: Watkins Glen's Hannah Morse drives to the basket in traffic. Second: The Senecas' Danielle Leszyk prepares to shoot. She made the basket. Third: Watkins Glen's Taylor Kelly shoots. Fourth: The Senecas' Adrienna Solomon goes to the hoop. Bottom: Watkins Glen Coach Alicia Learn addresses her players during a timeout. Watkins Glen's Aislinn Klemann, left, defends against Cambridge's Lilly Phillips. Left: A shot attempt by Watkins Glen's Kelsey Kernan is blocked by Cambridge's Sophie Phillips. Right: Kernan looks to pass the ball. Watkins Glen's Hannah Morse passes the ball as she nears the basket. Left: Watkins Glen's Danielle Leszyk drives toward the basket. Right: The Senecas' Adrienna Solomon shoots from the corner. Left: Watkins Glen's Taylor Kelly goes high on a jump shot. Right: The Senecas' Hannah Morse hugs teammate Danielle Leszyk after both were named to the All-Tournament team. From left: Watkins Glen's Adrienna Solomon, Abby Gibson and Mattie Yontz watch as the game's final minute winds down. Left: Watkins' Adrienna Solomon launches a shot. Right: The Senecas' Hannah Morse at the free-throw line, with teammate Jena Slater in the background. Watkins Glen Coach Alicia Learn accepts the NYSPHSAA Class C Finalist plaque. Players in the background are, from left, Ali LaMoreaux, Hannah Morse and Mattie Yontz. Coaches Harold Chaffee (right), Ralph Diliberto and Alicia Learn congratulate and encourage their players after the game for their remarkable season. Watkins Glen's Kelsey Kernan takes the ball to the basket for two points. TROY, March 15, 2019 -- The Watkins Glen girls varsity basketball team built an early 10-point lead, saw it disappear, and then pulled away from defending state Class C champion Millbrook to post a 53-42 victory Friday afternoon in a semifinal of the New York State Public High School Athletic Association state championships at Hudson Valley Community College. Seniors Taylor Kelly and Danielle Leszyk scored 18 and 17 points, respectively, as the Senecas set up a state championship game -- its second in three years -- Saturday night against Section 2's Cambridge, which defeated Maple Grove in the other Class C semifinal, 75-43. "It's a really cool feeling,' said Watkins Glen Coach Alicia Learn. "It's great for these girls; the experience is awesome." As for the Senecas' possible path to victory in the final: "Defense wins games," said Learn, "so we have to step up our defense and do our thing." About the semifinal: "We knew we had to key in on number 21" -- Millbrook's Erin Fox, a 6-foot junior who was the Class C Player of the Year as a sophomore, when she led her team to the state title. "She's a great player," said Learn, "and she scored, but that's what she's supposed to do." Fox scored 28 points -- two-thirds of her team's total. "Our girls stepped up," said Learn, "and we kept No. 1 (senior Sam McKenna) contained." And stepping up big was Leszyk "on offense, and she played great defense. The girls didn't want to go home. We've come this far ... they wanted to keep going. Now we have one more game." The Senecas (21-4) had some early concern when Kelly was whistled twice by officials, but Learn said "we saw what the refs were doing, so we adjusted." Nobody on the team ended up with more than three fouls. Hannah Morse, the senior point guard who directed the offense and assisted on nearly a dozen baskets while scoring 4 points, was enthusiastic afterward. "I did my best; I did my best," she said. "We knew 21 would score; she's so good. I give her total respect; she played a great game. Our game plan was we knew she was going to score. We just had to try and limit it, and it worked. I'm pumped." The team was 9-for-11 from the foul line. Millbrook was 8-for-ll from the line. The Senecas broke in front on a Kelly 3-pointer mere seconds into the game, and built the lead to 7-2 on two Kelly 2-pointers. The lead grew to 15-7 by the end of the first quarter on a Morse foul shot, another Kelly basket (and free throw), and then two baskets by Leszyk driving the lane. The lead grew to 17-7 early in the second period on a Kernan 2-pointer off a Morse feed, but then Millbrook went on a run, scoring the next 12 points and taking the lead 19-17. Leszyk ended the drought with a 3-pointer, and Slater added a basket with 20 seconds left in the half to send the Senecas to the locker room with a 22-19 lead. Millbrook quickly tied the game in the third quarter on a 3-pointer before Leszyk scored to put Watkins ahead again 24-22. The lead seesawed over to Millbrook as it built a 29-26 lead, but a 3-pointer by Kelly evened things up, and another 3-pointer by Kelly and one by Leszyk put the Senecas up by six points, 35-29 -- and they never trailed again. Two baskets by Kernan held Millbrook at bay, and Watkins entered the fourth quarter up 39-33. A 3-pointer by Leszyk gave the Senecas a nine-point bulge, 42-33, and she followed that with a floater for 2 points and a 44-34 edge. Millbrook climbed within six points, 44-38, but the lead grew back to 10, at 48-38, on two free throws by Kelly and a basket by Solomon with 1:52 remaining. After that, Morse sank three of four free throws and Kernan converted two foul shots while Millport managed two baskets. Top: Watkins' Taylor Kelly, left, and Danielle Leszyk are congratulated after the win. Middle: Watkins Coach Alicia Learn is interviewed after the game. Bottom: Learn addresses her team during a timeout. The Watkins Glen girls varsity basketball team poses after its semifinal victory Friday. Left: The Senecas prepare to enter the court before the game. Right: Watkins Glen's Hannah Morse at the free-throw line late in the game. Left: Watkins Glen's Aislinn Klemann lines up a shot. Right: The Senecas' Danielle Leszyk drives past a Millbrook defender. Left: The Senecas' Adrienna Solomon shoots. Right: And so does Watkins' Taylor Kelly. Left: Watkins' Kelsey Kernan at the free-throw line late in the game. Right: Kelsey Kernan with her sister Katlyn, who was on the Senecas' state title team two years ago. Watkins Glen's Hannah Morse passes the ball past three Millbrook defenders. From left: Watkins Glen's Abby Gibson, Hannah Morse and Mattie Yontz after the game. Watkins Glen's Jena Slater (foregound) dives for a loose ball. Left: Watkins' Danielle Leszyk receives congratulations. Right: From left, the Senecas' Ali LaMoreaux, Adrienna Solomon and Jena Slater. Watkins Coach Alicia Learn high-fives players along the bench after the win was secure. The Watkins coaches and players applaud Watkins fans across the court after the game. BROCKPORT, March 12, 2019 -- Watkins Glen High School 2018 graduate Alexis Castellaneta has been honored as Athlete of the Week at SUNY Brockport after being named to the National Collegiate Gymnastics Association All-Championship team as well as earning designation as the NCGA East Region's Rookie of the Year. Lexi, a multiple-year Section IV diving champion in high school, is concentrating on gymnastics at Brockport -- a sport she pursued on the club level while diving for WGHS. She was a USAIGC (United States Association of Independent Gymnastics Clubs) World AA champion in 2013 and a USAIGC World Beam and Floor champion in 2014. A daughter of Niki and Tony Castellaneta and currently seeking a nursing degree, the 4-9 Lexi was among nine members of Brockport gymnastics named to the NCGA All-Championship team following the NCGA East Regional Competition on March 10 in Cortland -- a tournament won by Brockport as it qualified for the NCGA National Championship tourney on March 23 in Oshkosh, Wisconsin. The NCGA selects the All-Championship team -- 10 athletes from each region on each event -- based on the top five finishers in each regional tournament plus the top five highest season average scores going into the tournament. Lexi tied as the top Floor competitor at regionals with a 9.900, a personal-best score. She was second in the Beam event with a 9.750. She helped her Golden Eagles team to its highest ever all-around East Regional team score. The Watkins Glen girls varsity basketball team poses after winning the regional title. BINGHAMTON, March 11, 2019 -- The Watkins Glen girls varsity basketball team advanced to its second Final Four in three years Sunday by defeating Cooperstown 60-49 in a regional title game at the Binghamton Arena. The Senecas, led by Taylor Kelly's 20 points and 17 by Hannah Morse, will face last year's Class C champion, Millbrook, in a semifinal at Hudson Valley Community College at 1:30 p.m. Friday. The last time the Senecas reached the Final Four -- two seasons ago -- they won the state title with a comeback victory (from 16 points down with 6:30 to play) in the championship game. Watkins Glen, after a first-period Sunday in which coach Alicia Learn said her players were "settling in" -- hitting just one of a dozen shots and trailing 7-6 -- sank five of its first six shots in the second quarter on the way to a 21-12 advantage in that period and a 27-19 halftime lead. The third period was more of the same as the Senecas outscored the Hawkeyes 19-10 to build a 46-29 lead. And they scored the first seven points of the fourth quarter to extend the advantage to 24 points -- 53-29 -- before the momentum turned as Cooperstown started pressuring Watkins the full length of the court, forcing several turnovers and running off 15 straight points in an 18-1 run that cut the Senecas' edge to seven points, 54-47, with 49 seconds left to play. "We got a little rattled," said Morse after the game. "We needed a cooling down period," provided by a couple of time-outs. "But it turned out okay," she added. "The game was a little sloppy," said Learn in a post-game interview. "We have some things we have to work on" over the next three days, before the Senecas leave for the Final Four on Thursday. Once there, she said, she hopes to find a gym for some more practice. As for the Cooperstown comeback, she said the Hawkeyes "were here for a reason" -- that reason being a Section III championship. With the lead down not lower than seven points, "I knew we weren't going to lose," she added, "but it was getting too sloppy." Her team "played with heart, they didn't give up. They didn't get down on themselves," she said, noting that the Senecas' strengths were"attacking the basket" -- which they did frequently -- "and I think our defense was pretty good," although the Senecas encountered some foul trouble. Kelsey Kernan fouled out in the final minute, and Adrienna Solomon, Danielle Leszyk and Morse each finished with four fouls. Taylor Kelly: 20 points, 3 rebounds, 1 assist, 1 steal. Hannah Morse: 17 points, 6 rebounds, 8 assists, 3 steals, 1 block. Danielle Leszyk: 9 points, 6 rebounds, 2 assists, 2 steals. Adrienna Solomon: 7 points, 7 rebounds. Kelsey Kernan: 2 rebounds, 2 steals. Jena Slater: 4 points, 1 rebound. Aislinn Klemann: 3 points, 2 rebounds. --Watkins Glen (now 20-4) hit five 3-pointers -- including two by Morse and one each by Kelly, Leszyk and Klemann. Cooperstown hit three 3's. --The Senecas converted 15 of 23 free throws, including 6 of 8 in the final 43 seconds as Cooperstown fouled in the hope of rebounding misses and scoring more points. The Watkins edge in those 43 seconds was 6-2. Next up: A New York State Class C semifinal versus Millbrook at 1:30 p.m. Friday, March 15 at Hudson Valley Community College. The winner advances to the title game, scheduled for 7 p.m. Saturday. Top: Watkins Glen's Hannah Morse shoots under pressure. Middle: The Senecas' Taylor Kelly drives to the basket. Bottom: Watkins Glen's Danielle Leszyk prepares to launch a free throw. Left: Watkins Glen's Aislinn Klemann prepares to shoot a 3-pointer. Right: The Senecas' Adrienna Solomon battles for a rebound. Left: Watkins Glen's Kelsey Kernan shoots from under the basket. Right: The Senecas' Hannah Morse eyes the basket from the foul line. Left: Watkins Glen's Adrienna Solomon shoots. Right: The Senecas' Jena Slater. Left: Watkins Glen's Danielle Leszyk sends a shot on its way. Right: The Senecas' Aislinn Klemann at the free-throw line. Watkins Glen's Jena Slater sends a bounce pass to teammate Taylor Kelly (24) as Kelly moves across the court toward the corner. Left: Watkins Glen coach Alicia Learn. Right: The Senecas' Taylor Kelly drives to the basket after stealing the ball and racing upcourt. Watkins Glen's Hannah Morse takes off with the ball after stealing it from Cooperstown's Kate Trosset (12). The following are the results from Week 5 of the Odessa-Montour Elementary Basketball League at the school. Thank you to our sponsors, Bucket Bar and Grill, Montour Moose Lodge, Vedder and Scott Funeral Home, and Watkins Supply as well as all of our volunteers for their help in making our Saturday morning youth basketball program a success in 2019. ADDISON, March 7, 2019 -- The Strikers U10 girls indoor soccer team won a tournament held March 3rd at the Addison High School in Addison, NY. The team played three regular games -- against Dansville, Addison and Hornell -- and then beat Wayland-Cohocton in the semifinals. The team went on to beat Alfred-Almond in the final game 1-0 with the game-winning goal scored by Natalie VanSkiver in the closing minutes. BATH, March 7, 2019 -- The Strikers U12 girls indoor soccer team won a tournament held March 3rd at the Haverling High School in Bath, NY. The Strikers played three regular games -- against two Arkport teams and Penn Yan. The team went on to beat Bath in the final game 2-1 in sudden-death overtime. The Strikers' Skye Honrath scored the game-tying goal and Madison Tuttle scored the game-winning goal with two minutes remaining to win the championship. WARSAW, March 7, 2019 -- -- The Strikers U14 girls indoor soccer team won a tournament held March 2nd at the Warsaw High School in Warsaw, NY. The WGHS tandem of Hannah Morse and Taylor Kelly -- two seniors who have played basketball together since Modified days -- were the standouts on a standout team that earned the school its fourth Section IV girls title in five seasons. Others contended for the MVP honor: Dylan Houseknecht, O-M wrestler extraordinaire who won the New York State Division II title at 285 pounds; Jackie Vincent, who led the O-M bowling team to the State Qualifier; and Isaac McIlroy and Joe Chedzoy, who led the WGHS boys basketball team to the Interscholastic Athletic Conference Large School championship. For various reasons -- the MVP tag, to our thinking, connotes both outstanding performance and value of such a nature that an athlete's team has been lifted by him or her to unexpected heights -- the weight here falls to the two remarkable seniors: Morse and Kelly, or TK. Morse is the floor general, the player who brings the ball upcourt, organizes the offense, looks for a weakness in the opposition and often drives around or through traffic, drawing defenders and opening up teammates for pinpoint passes and, often, resultant easy baskets. Her stat line is generally full of assists and steals, in addition to points and rebounds. (Her most memorable drive, of course, came two seasons ago on the final play of the Class C state championship game, when she raced around three defenders and put up a soft title-winning shot that dropped through the cylinder as time expired.) She has succeeded at other sports, as well: tennis and, more notably, soccer, where she set school single-season and career goal-scoring records. But this season, she reaffirmed her outstanding basketball and leadership skills. TK is a gifted athlete -- seemingly good at whatever sport she tries. She was an excellent setter a couple of years ago on the volleyball team before shifting to soccer, where she was a steady goal-scorer. She is tall, and intuitive, and quick -- and aligned with whatever Morse is doing on the basketball court, often fielding a pass from the general and laying it in. She is particularly adept at driving to the hoop -- although her barrage of 3-pointers in the recent Section IV title win over Unatego was eye-popping: a school-record-tying seven of them, including six in the first half alone. She had four in the first quarter, and five in the first 9:30. She shifted gears in the second half -- driving to the hoop and either scoring, drawing fouls or passing the ball: basically creating mayhem, a commodity that has been a staple of the Senecas' success. The going now for the girls basketball team gets that much harder as it faces other sectional winners. First on the schedule is Section III's Cooperstown, Sunday at the Binghamton Arena. We wish Hannah and Taylor and the rest of the Seneca basketball roster all the best. Photos in text: Taylor Kelly (top) and Hannah Morse in the Section IV, Class C title game. Honorable Mention: Aislinn Klemann (WG basketball), Jena Slater (WG basketball), Jolynn Minnier (OM basketball), Kara Reese (OM basketball), Jacob DeJong (WG basketball), Lance Majors (WG track), Cierra Barber (WG track), Scott Brubaker (WG swimming), Georgio Fazzary (WG swimming), Cale Sutterby (WG track), Derrick Lewis (OM basketball), Tyler Carson (OM swimming), Jacob Mayette (OM swimming), Josh Beckley (OM wrestling), Justin Ruocco (OM swimming), Matt Irwin (WG bowling), Alex Pesco (WG bowling), RJ Bannon (WG bowling), Nancy Jackson (OM bowling), Makenzie Kellogg (WG bowling), Austin Hoyt (OM bowling). 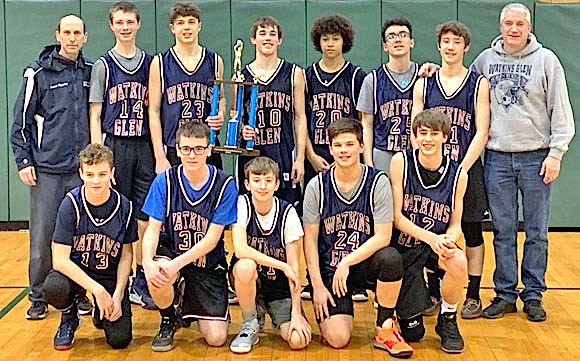 ELMIRA, March 4, 2019 -- A Watkins Glen High School team of 7th through 9th graders won the annual Kamas-Galloway Boys Basketball Tournament held over the last week in Elmira by the Southern New York Basketball Officials Chapter. The team won all three games it played, beating Corning in the championship game 56-35. Owen Scholtisek was named to the All-Tourney team, with Travon Jones named the tournament MVP. "All our kids played well and contributed to our success," said one of the coaches. "The WG defense once again came through, helping to seal our wins." ODESSA, March 4, 2019 -- The Odessa-Montour girls modified basketball team finished the season with a perfect 12-0 record. The team, with three 7th graders and three 8th graders, had two close games the entire season, easily posting wins in the other 10. "All of the girls made strong contributions to their wins this season," said one observer, "whether scoring, rebounding, assisting or forcing turnovers by the other team. They were a selfless team and, oh, so fun to watch." The Watkins Glen High School girls varsity basketball team poses after winning the Section IV, Class C championship. CORTLAND, March 3, 2019 --The Watkins Glen High School girls varsity basketball team built an 18-point lead in the second quarter and then held off a determined and top-seeded Unatego Saturday to win its fourth Section IV championship in five years, 53-42, in the Class C title game at SUNY Cortland. The Senecas advance now to play Section III's Cooperstown (19-5) next Sunday in an intersectional contest at the Binghamton Arena. Seneca senior Taylor Kelly led the way Saturday with 25 points, including a school-record-tying seven 3-pointers, six of them in the first half. She had her first one 15 seconds into the game, four in the first period, and five just 9:30 into the game. She said afterward that she did not learn of the record until after the game, long after she had abandoned the 3-ball for drives to the basket. Her record tied that of alums Amy Chaffee-Hildreth and Amanda Crans. Chaffee was in the stands Saturday, and said afterward that she was hoping that TK would set a new mark. But there was more than Kelly, as impressive as her shooting was. The Senecas never trailed, and built an 18-point lead at 29-11 before Unatego showed its mettle by scoring the last nine points of the first half and first two points of the second half to cut the Watkins advantage to 29-22. After that, one Seneca after another seemed to rise to the occasion when needed, with a basket, an assist or a rebound. Kelsey Kernan, for instance, had 13 points; Hannah Morse had 8 points and 8 assists. The statistics show the distribution of achievement. Taylor Kelly: 25 points, seven 3-pointers, 5 rebounds, 1 steal. Danielle Leszyk: 4 points, 5 rebounds, 3 assists, 1 steal. Adrienna Solomon: 3 points, 4 rebounds, 3 assists, 1 steal, 1 block. Kelsey Kernan: 13 points, 4 rebounds, 1 assist, 3 steals, 1 block. Hannah Morse: 8 points, 3 rebounds, 8 assists, 1 steal. The 19-4 and second-seeded Senecas never trailed, with Kelly launching them in front early and the various members of the squad rising to meet the challenge as Unatego -- led by Meghan Perry's 21 points -- closed in. There were layups by Kernan, a timely 3-ball by Leszyk that expanded a 6-point lead to 9 points; and so on. The closest Unatego got was five points, at 39-34 with 2:17 left in the third quarter, at 45-40 with 5:04 left in the fourth quarter, and 47-42 with 3:39 remaining. After that, a Kernan layup and free throw at 3:13 made it 50-42, and free throws down stretch by Solomon, Leszyk and Morse closed out the scoring. But the key, said both Morse and Coach Alicia Learn, was defense. "We had to really lock down" on defense," said Morse. "They're a good shooting team." But she was also shaking her head about Kelly's performance. After TK had hit all those first-half baskets, she told Morse this: "I'm usually not good at this part of the game. I'm usually good at taking it to the basket." "And I," said Morse, "was like, 'Well, take it to the basket now that they know you can shoot.'" Which is what Kelly did. Those six 3-pointers in the first half, Morse added, "have got to be a record." The girls, said Coach Learn, were excellent on defense and "played together as a team." She said Kelly's 3-point barrage wasn't part of the game plan, "but I liked it. She really got hot." Up next, Learn noted, is the Binghamton Arena and the Cooperstown team, which defeated the Senecas in intersectionals after the first and second sectional titles achieved by Watkins Glen during Learn's coaching run. The year after that, Watkins won its section again, but Cooperstown didn't win in Section III. That was the year -- two seasons ago -- when the Senecas won the state championship. Last year brought the only bump in Watkins Glen's sectional-crown run as the Senecas fell to Bainbridge-Guilford in the Section IV final. Learn's feeling as her team points toward the showdown with Cooperstown? She was enjoying the moment. Looking across the lobby where she was being interviewed, and where players had gathered to meet with family and friends, Learn smiled. "I'm proud of them," she said. Top: Watkins Glen's Taylor Kelly unleashes a shot in traffic. Second: The Senecas' Adrienna Solomon swats away an attempted Unatego shot. Third: Watkins Glen's Hannah Morse prepares to pass the ball. Bottom: The medal presented to each member of the winning team. Watkins Glen's Hannah Morse passes the ball around a Unatego defender. Left: Watkins Glen's Jena Slater looks to pass. Right: The Senecas' Danielle Leszyk drives past a Unatego defender on her way to the basket. Watkins Glen's Adrienna Solomon, left, and Kelsey Kernan congratulate each other after the Senecas won the Section IV, Class C title. From left: Watkins Glen's Kelsey Kernan at the free-throw line, Danielle Leszyk shoots, and Kernan follows through on a shot. Watkins Glen's Taylor Kelly and the crowd behind her follow the flight of a 3-point shot. Left: Watkins Glen's Aislinn Klemann follows through on a shot. Right: The Senecas' Hannah Morse drives to the hoop. Left: Watkins Glen's Adrienna Solomon (20) reaches in vain for a rebound. Right: The Senecas' Taylor Kelly races to the hoop. Ray Dandridge is in the Baseball Hall of Fame -- one of its more obscure members. Herewith a look at the man. Lore. Bubba Phillips was a journeyman major league baseball player in the 1950s and 1960s -- not normally the stuff of hero worship. But he was hero to the writer of this story -- and friend. Bubba. This is a story about an unusual -- and quite beautiful -- visit to Cooperstown in the dead of winter. It's titled "Holy Night." Holy. A childhood tale: "Damn Yankees"